This Technote describes the on-disk format for an HFS Plus volume. It does not describe any programming interfaces for HFS Plus volumes. This technote is directed at developers who need to work with HFS Plus at a very low level, below the abstraction provided by the File Manager programming interface. This includes developers of disk recovery utilities and programmers implementing HFS Plus support on other platforms. This technote assumes that you have a conceptual understanding of the HFS volume format, as described in Inside Macintosh: Files. HFS Plus is a volume format for Mac OS. HFS Plus was introduced with Mac OS 8.1. HFS Plus is architecturally very similar to HFS, although there have been a number of changes. The following table summarizes the important differences. The extent to which these HFS Plus features are available through a programming interface is OS dependent. Mac OS versions less than 9.0 do not provide programming interfaces for any HFS Plus-specific features. ease booting on non-Mac OS operating systems. The following sections describes these goals, and the differences between HFS and HFS Plus required to meet these goals. HFS divides the total space on a volume into equal-sized pieces called allocation blocks. It uses 16-bit fields to identify a particular allocation block, so there must be less than 216 (65,536) allocation blocks on an HFS volume. The size of an allocation block is typically the smallest multiple of 512 such that there are less than 65,536 allocation blocks on the volume (i.e., the volume size divided by 65,535, rounded up to a multiple of 512). Any non-empty fork must occupy an integral number of allocation blocks. This means that the amount of space occupied by a fork is rounded up to a multiple of the allocation block size. As volumes (and therefore allocation blocks) get bigger, the amount of allocated but unused space increases. HFS Plus uses 32-bit values to identify allocation blocks. This allows up to 2 32 (4,294,967,296) allocation blocks on a volume. More allocation blocks means a smaller allocation block size, especially on volumes of 1 GB or larger, which in turn means less average wasted space (the fraction of an allocation block at the end of a fork, where the entire allocation block is not actually used). It also means you can have more files, since the available space can be more finely distributed among a larger number of files. This change is especially beneficial if the volume contains a large number of small files. HFS uses 31-byte strings to store file names. HFS does not store any kind of script information with the file name to indicate how it should be interpreted. File names are compared and sorted using a routine that assumes a Roman script, wreaking havoc for names that use some other script (such as Japanese). Worse, this algorithm is buggy, even for Roman scripts. The Finder and other applications interpret the file name based on the script system in use at runtime. The problem with using non-Roman scripts in an HFS file name is that HFS compares file names in a case- insensitive fashion. The case-insensitive comparison algorithm assume a MacRoman encoding. When presented with non-Roman text, this algorithm fails in strange ways. The upshot is that HFS decides that certain non-Roman file names are duplicates of other file names, even though they are not duplicates in the source encoding. HFS Plus uses up to 255 Unicode characters to store file names. Allowing up to 255 characters makes it easier to have very descriptive names. Long names are especially useful when the name is computer-generated (such as Java class names). The HFS catalog B-tree uses 512-byte nodes. An HFS Plus file name can occupy up to 512 bytes (including the length field). Since a B-tree index node must store at least two keys (plus pointers and node descriptor), the HFS Plus catalog must use a larger node size. The typical node size for an HFS Plus catalog B-tree is 4 KB. In the HFS catalog B-tree, the keys stored in an index node always occupy a fixed amount of space, the maximum key size. In HFS Plus, the keys in an index node may occupy a variable amount of space determined by the actual size of the key. This allows for less wasted space in index nodes and creates, on typical disks, a substantially larger branching factor in the tree (requiring fewer node accesses to find any given record). Files on an HFS volume have two forks: a data fork and a resource fork, either of which may be empty (zero length). Files and directories also contain a small amount of additional information (known as catalog information or metadata) such as the modification date or Finder info. Apple software teams and third-party developers often need to store information associated with particular files and directories. In some cases (for example, custom icons for files), the data or resource fork is appropriate. But in other cases (for example, custom icons for directories, or File Sharing access privileges), using the data or resource fork is not appropriate or not possible. HFS Plus has an attribute file, another B-tree, that can be used to store additional information for a file or directory. Since it is part of the volume format, this information can be kept with the file or directory as is it moved or renamed, and can be deleted when the file or directory is deleted. The contents of the attribute file's records have not been fully defined yet, but the goal is to provide an arbitrary number of forks, identified by Unicode names, for any file or directory. Because the attributes file has not been fully defined yet, current implementations are unable to delete named forks when a file or directory is deleted. Future implementations that properly delete named forks will need to check for these orphaned named forks and delete them when the volume is mounted. The lastMountedVersion field of the volume header can be used to detect when such a check needs to take place. Whenever possible, an application should delete named forks rather than orphan them. HFS Plus defines a special startup file, an unstructured fork that can be found easily during system startup. The location and size of the startup file is described in the volume header. The startup file is especially useful on systems that don't have HFS or HFS Plus support in ROM. In many respects, the startup file is a generalization of the HFS boot blocks, one that provides a much larger, variable-sized amount of storage. Each of these complex structures is described in its own section. The purpose of this section is to give an overview of the volume format, describe how the structures fit together, and define the primitive data types used by HFS Plus. HFS Plus is a specification of how a volume (files that contain user data, along with the structure to retrieve that data) exists on a disk (the medium on which user data is stored). The storage space on a disk is divided into units called sectors. A sector is the smallest part of a disk that the disk's driver software will read or write in a single operation (without having to read or write additional data before or after the requested data). The size of a sector is usually based on the way the data is physically laid out on the disk. For hard disks, sectors are typically 512 bytes. For optical media, sectors are typically 2048 bytes. Most of the data structures on an HFS Plus volume do not depend on the size of a sector, with the exception of the journal. Because the journal does rely on accessing individual sectors, the sector size is stored in the jhdr_size field of the journal header (if the volume has a journal). HFS Plus allocates space in units called allocation blocks; an allocation block is simply a group of consecutive bytes. The size (in bytes) of an allocation block is a power of two, greater than or equal to 512, which is set when the volume is initialized. This value cannot be easily changed without reinitializing the volume. Allocation blocks are identified by a 32-bit allocation block number, so there can be at most 232 allocation blocks on a volume. Current implementations of the file system are optimized for 4K allocation blocks. For the best performance, the allocation block size should be a multiple of the sector size. If the volume has an HFS wrapper, the wrapper's allocation block size and allocation block start should also be multiples of the sector size to allow the best performance. All of the volume's structures, including the volume header, are part of one or more allocation blocks (with the possible exception of the alternate volume header, discussed below). This differs from HFS, which has several structures (including the boot blocks, master directory block, and bitmap) which are not part of any allocation block. To promote file contiguity and avoid fragmentation, disk space is typically allocated to files in groups of allocation blocks, or clumps. The clump size is always a multiple of the allocation block size. The default clump size is specified in the volume header. The actual algorithm used to extend files is not part of this specification. The implementation is not required to act on the clump values in the volume header; it merely provides space to store those values. The current non-contiguous algorithm in Mac OS will begin allocating at the next free block it finds. It will extend its allocation up to a multiple of the clump size if there is sufficient free space contiguous with the end of the requested allocation. Space is not allocated in contiguous clump-sized pieces. Every HFS Plus volume must have a volume header. The volume header contains sundry information about the volume, such as the date and time of the volume's creation and the number of files on the volume, as well as the location of the other key structures on the volume. The volume header is always located at 1024 bytes from the start of the volume. A copy of the volume header, known as the alternate volume header, is stored starting at 1024 bytes before the end of the volume. The first 1024 bytes of volume (before the volume header), and the last 512 bytes of the volume (after the alternate volume header) are reserved. All of the allocation blocks containing the volume header, alternate volume header, or the reserved areas before the volume header or after the alternate volume header, are marked as used in the allocation file. The actual number of allocation blocks marked this way depends on the allocation block size. An HFS Plus volume contains five special files, which store the file system structures required to access the file system payload: folders, user files, and attributes. The special files are the catalog file, the extents overflow file, the allocation file, the attributes file and the startup file. Special files only have a single fork (the data fork) and the extents of that fork are described in the volume header. 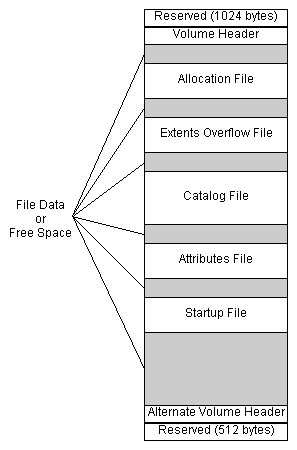 The catalog file is a special file that describes the folder and file hierarchy on a volume. The catalog file contains vital information about all the files and folders on a volume, as well as the catalog information, for the files and folders that are stored in the catalog file. The catalog file is organized as a B-tree (or "balanced tree") to allow quick and efficient searches through a large folder hierarchy. The catalog file stores the file and folder names, which consist of up to 255 Unicode characters, as described below. The B-Trees section contains an in-depth description of the B-trees used by HFS Plus. HFS Plus tracks which allocation blocks belong to a fork by maintaining a list of the fork's extents. An extent is a contiguous range of allocation blocks allocated to some fork, represented by a pair of numbers: the first allocation block number and the number of allocation blocks. For a user file, the first eight extents of each fork are stored in the volume's catalog file. Any additional extents are stored in the extents overflow file, which is also organized as a B-tree. The extents overflow file also stores additional extents for the special files except for the extents overflow file itself. However, if the startup file requires more than the eight extents in the Volume Header (and thus requires additional extents in the extents overflow file), it would be much harder to access, and defeat the purpose of the startup file. So, in practice, a startup file should be allocated such that it doesn't need additional extents in the extents overflow file. The allocation file is a special file which specifies whether an allocation block is used or free. This performs the same role as the HFS volume bitmap, although making it a file adds flexibility to the volume format. The startup file is another special file which facilitates booting of non-Mac OS computers from HFS Plus volumes. Finally, the bad block file prevents the volume from using certain allocation blocks because the portion of the media that stores those blocks is defective. The bad block file is neither a special file nor a user file; this is merely convention used in the extents overflow file. See Bad Block File for more details. The general structure of an HFS Plus volume is illustrated in Figure 1. Figure 1. Organization of an HFS Plus Volumes. The volume header is always at a fixed location (1024 bytes from the start of the volume). However, the special files can appear anywhere between the volume header block and the alternate volume header block. These files can appear in any order and are not necessarily contiguous. The information on HFS Plus volumes (with the possible exception of the alternate volume header, as discussed below) is organized solely in allocation blocks. Allocation blocks are simply a means of grouping space on the media into convenient parcels. The size of an allocation block is a power of two, and at least 512. The allocation block size is a volume header parameter whose value is set when the volume is initialized; it cannot be changed easily without reinitializing the volume. The allocation block size is a classic speed-versus- space tradeoff. Increasing the allocation block size decreases the size of the allocation file, and often reduces the number of separate extents that must be manipulated for every file. It also tends to increase the average size of a disk I/O, which decreases overhead. Decreasing the allocation block size reduces the average number of wasted bytes per file, making more efficient use of the volume's space. While HFS Plus disks with an allocation block size smaller than 4 KB are legal, DTS recommends that you always use a minimum 4 KB allocation block size. Disks with a smaller allocation block size will be markedly slower when used on systems that do 4 KB clustered I/O, such as Mac OS X Server. This section describes the primitive data types used on an HFS Plus volume. All data structures in this volume are defined in the C language. The specification assumes that the compiler will not insert any padding fields. Any necessary padding fields are explicitly declared. The HFS Plus volume format is largely derived from the HFS volume format. When defining the new format, it was decided to remove unused fields (primarily legacy MFS fields) and arrange all the remaining fields so that similar fields were grouped together and that all fields had proper alignment (using PowerPC alignment rules). When creating a structure with a reserved field, an implementation must set the field to zero. When reading existing structures, an implementation must ignore any value in the field. When modifying a structure with a reserved field, an implementation must preserve the value of the reserved field. This definition allows for backward-compatible enhancements to the volume format. Pad fields have exactly the same semantics as a reserved field. The different name merely reflects the designer's goals when including the field, not the behavior of the implementation. All integer values are defined by one of the following primitive types: UInt8, SInt8, UInt16, SInt16, UInt32, SInt32, UInt64, and SInt64. These represent unsigned and signed (2's complement) 8-bit, 16-bit, 32-bit, and 64-bit numbers. All multi-byte integer values are stored in big-endian format. That is, the bytes are stored in order from most significant byte through least significant byte, in consecutive bytes, at increasing offset from the start of a block. Bits are numbered from 0 to n-1 (for types UIntn and SIntn), with bit 0 being the least significant bit. File and folder names on HFS Plus consist of up to 255 Unicode characters with a preceding 16-bit length, defined by the type HFSUniStr255. UniChar is a UInt16 that represents a character as defined in the Unicode character set defined by The Unicode Standard, Version 2.0 [Unicode, Inc. ISBN 0-201-48345-9]. HFS Plus stores strings fully decomposed and in canonical order. HFS Plus compares strings in a case-insensitive fashion. Strings may contain Unicode characters that must be ignored by this comparison. For more details on these subtleties, see Unicode Subtleties. A variant of HFS Plus, called HFSX, allows volumes whose names are compared in a case-sensitive fashion. The names are fully decomposed and in canonical order, but no Unicode characters are ignored during the comparison. Traditional Mac OS programming interfaces pass filenames as Pascal strings (either as a StringPtr or as a Str63 embedded in an FSSpec). The characters in those strings are not Unicode; the encoding varies depending on how the system software was localized and what language kits are installed. Identical sequences of bytes can represent vastly different Unicode character sequences. Similarly, many Unicode characters belong to more than one Mac OS text encoding. HFS Plus includes two features specifically designed to help Mac OS handle the conversion between Mac OS-encoded Pascal strings and Unicode. The first feature is the textEncoding field of the file and folder catalog records. This field is defined as a hint to be used when converting the record's Unicode name back to a Mac OS- encoded Pascal string. The valid values for the textEncoding field are defined in Table 2. Non-Mac OS implementations of HFS Plus may choose to simply ignore the textEncoding field. In this case, the field must be treated as a reserved field. Mac OS uses the textEncoding field in the following way. When a file or folder is created or renamed, Mac OS converts the supplied Pascal string to a HFSUniStr255. It stores the source text encoding in the textEncoding field of the catalog record. When Mac OS needs to create a Pascal string for that record, it uses the textEncoding as a hint to the text conversion process. This hint ensures a high-degree of round-trip conversion fidelity, which in turn improves compatibility. The second use of text encodings in HFS Plus is the encodingsBitmap field of the volume header. For each encoding used by a catalog node on the volume, the corresponding bit in the encodingsBitmap field must be set. It is acceptable for a bit in this bitmap to be set even though no names on the volume use that encoding. This means that when an implementation deletes or renames an object, it does not have to clear the encoding bit if that was the last name to use the given encoding. The text encoding value is used as the number of the bit to set in encodingsBitmap to indicate that the encoding is used on the volume. However, encodingsBitmap is only 64 bits long, and thus the text encoding values for MacFarsi and MacUkrainian cannot be used as bit numbers. Instead, another bit number (shown in parenthesis) is used. Mac OS uses the encodingsBitmap field to determine which text encoding conversion tables to load when the volume is mounted. Text encoding conversion tables are large, and loading them unnecessarily is a waste of memory. Most systems only use one text encoding, so there is a substantial benefit to recording which encodings are required on a volume-by-volume basis. Non-Mac OS implementations of HFS Plus must correctly maintain the encodingsBitmap field. Specifically, if the implementation sets the textEncoding field a catalog record to a text-encoding value, it must ensure that the corresponding bit is set in encodingsBitmap to ensure correct operation when that disk is mounted on a system running Mac OS. HFS Plus stores dates in several data structures, including the volume header and catalog records. These dates are stored in unsigned 32-bit integers (UInt32) containing the number of seconds since midnight, January 1, 1904, GMT. This is slightly different from HFS, where the value represents local time. The maximum representable date is February 6, 2040 at 06:28:15 GMT. The date values do not account for leap seconds. They do include a leap day in every year that is evenly divisible by four. This is sufficient given that the range of representable dates does not contain 1900 or 2100, neither of which have leap days. The implementation is responsible for converting these times to the format expected by client software. For example, the Mac OS File Manager passes dates in local time; the Mac OS HFS Plus implementation converts dates between local time and GMT as appropriate. The creation date stored in the Volume Header is NOT stored in GMT; it is stored in local time. The reason for this is that many applications (including backup utilities) use the volume's creation date as a relatively unique identifier. If the date was stored in GMT, and automatically converted to local time by an implementation (like Mac OS), the value would appear to change when the local time zone or daylight savings time settings change (and thus cause some applications to improperly identify the volume). The use of the volume's creation date as a unique identifier outweighs its use as a date. This change was introduced late in the Mac OS 8.1 project. For each file and folder, HFS Plus maintains a record containing access permissions, defined by the HFSPlusBSDInfo structure. The Mac OS X user ID of the owner of the file or folder. Mac OS X versions prior to 10.3 treats user ID 99 as if it was the user ID of the user currently logged in to the console. If no user is logged in to the console, user ID 99 is treated as user ID 0 (root). Mac OS X version 10.3 treats user ID 99 as if it was the user ID of the process making the call (in effect, making it owned by everyone simultaneously). These substitutions happen at run time. The actual user ID on disk is not changed. The Mac OS X group ID of the group associated with the file or folder. Mac OS X typically maps group ID 99 to the group named "unknown." There is no run time substitution of group IDs in Mac OS X.
BSD flags settable by the super-user only. This field corresponds to bits 16 through 23 of the st_flags field of struct stat in Mac OS X. See the manual page for chflags(2) for more information. The following table gives the bit position in the adminFlags field and the name of the corresponding mask used in the st_flags field. BSD flags settable by the owner of the file or directory, or by the super-user. This field corresponds to bits 0 through 7 of the st_flags field of struct stat in Mac OS X. See the manual page for chflags(2) for more information. The following table gives the bit position in the ownerFlags field and the name of the corresponding mask used in the st_flags field. BSD file type and mode bits. Note that the constants from the header shown below are in octal (base eight), not hexadecimal. In some versions of Unix, the sticky bit, S_ISTXT, is used to indicate that an executable file's code should remain in memory after the executable finishes; this can help performance if the same executable is used again soon. Mac OS X does not use this optimization. If the sticky bit is set for a directory, then Mac OS X restricts movement, deletion, and renaming of files in that directory. Files may be removed or renamed only if the user has write access to the directory; and is the owner of the file or the directory, or is the super-user. For hard link files, this field contains the link reference number. See the Hard Links section for more information. For indirect node files, this field contains the number of hard links that point at this indirect node file. See the Hard Links section for more information. For block and character special devices files (when the S_IFMT field contains S_IFCHR or S_IFBLK), this field contains the device number. Mac OS 8 and 9 treat the permissions as reserved. The S_IFWHT and UF_OPAQUE values are used when the file system is mounted as part of a union mount. A union mount presents the combination (union) of several file systems as a single file system. Conceptually, these file systems are layered, one on top of another. If a file or directory appears in multiple layers, the one in the top most layer is used. All changes are made to the top most file system only; the others are read-only. To delete a file or directory that appears in a layer other than the top layer, a whiteout entry (file type S_IFWHT) is created in the top layer. If a directory that appears in a layer other than the top layer is deleted and later recreated, the contents in the lower layer must be hidden by setting the UF_OPAQUE flag in the directory in the top layer. Both S_IFWHT and UF_OPAQUE hide corresponding names in lower layers by preventing a union mount from accessing the same file or directory name in a lower layer. If the S_IFMT field (upper 4 bits) of the fileMode field is zero, then Mac OS X assumes that the permissions structure is uninitialized, and internally uses default values for all of the fields. The default user and group IDs are 99, but can be changed at the time the volume is mounted. This default ownerID is then subject to substitution as described above. This means that files created by Mac OS 8 and 9, or any other implementation that sets the permissions fields to zeroes, will behave as if the "ignore ownership" option is enabled for those files, even if "ignore ownership" is disabled for the volume as a whole. HFS Plus maintains information about the contents of a file using the HFSPlusForkData structure. Two such structures -- one for the resource and one for the data fork -- are stored in the catalog record for each user file. In addition, the volume header contains a fork data structure for each special file. An unused extent descriptor in an extent record would have both startBlock and blockCount set to zero. For example, if a given fork occupied three extents, then the last five extent descriptors would be all zeroes. The size, in bytes, of the valid data in the fork. For HFSPlusForkData structures in the volume header, this is the fork's clump size, which is used in preference to the default clump size in the volume header. For HFSPlusForkData structures in a catalog record, this field was intended to store a per-fork clump size to override the default clump size in the volume header. However, Apple implementations prior to Mac OS X version 10.3 ignored this field. As of Mac OS X version 10.3, this field is used to keep track of the number of blocks actually read from the fork. See the Hot Files section for more information. The total number of allocation blocks used by all the extents in this fork. An array of extent descriptors for the fork. This array holds the first eight extent descriptors. If more extent descriptors are required, they are stored in the extents overflow file. The HFSPlusExtentRecord is also the data record used in the extents overflow file (the extent record). The HFSPlusExtentDescriptor structure is used to hold information about a specific extent. The first allocation block in the extent. The length, in allocation blocks, of the extent. Each HFS Plus volume contains a volume header 1024 bytes from the start of the volume. The volume header -- analogous to the master directory block (MDB) for HFS -- contains information about the volume as a whole, including the location of other key structures in the volume. The implementation is responsible for ensuring that this structure is updated before the volume is unmounted. A copy of the volume header, the alternate volume header, is stored starting 1024 bytes before the end of the volume. The implementation should only update this copy when the length or location of one of the special files changes. The alternate volume header is intended for use solely by disk repair utilities. The first 1024 bytes and the last 512 bytes of the volume are reserved. The first 1024 bytes are reserved for use as boot blocks; the traditional Mac OS Finder will write to them when the System Folder changes. The boot block format is outside the scope of this specification. It is defined in Inside Macintosh: Files. The last 512 bytes were used during Apple's CPU manufacturing process. The allocation block (or blocks) containing the first 1536 bytes (reserved space plus volume header) are marked as used in the allocation file (see the Allocation File section). Also, in order to accommodate the alternate volume header and the reserved space following it, the last allocation block (or two allocation blocks, if the volume is formatted with 512-byte allocation blocks) is also marked as used in the allocation file. The alternate volume header is always stored at offset 1024 bytes from the end of the volume. If the disk size is not an even multiple of the allocation block size, this area may lie beyond the last allocation block. However, the last allocation block (or two allocation blocks for a volume formatted with 512-byte allocation blocks) is still reserved even if the alternate volume header is not stored there. The volume header is described by the HFSPlusVolumeHeader type. The volume signature, which must be kHFSPlusSigWord ('H+') for an HFS Plus volume, or kHFSXSigWord ('HX') for an HFSX volume. The version of the volume format, which is currently 4 (kHFSPlusVersion) for HFS Plus volumes, or 5 (kHFSXVersion) for HFSX volumes. Volume attributes, as described below. A value which uniquely identifies the implementation that last mounted this volume for writing. This value can be used by future implementations to detect volumes that were last mounted by older implementations and check them for deficiencies. Any code which modifies the on disk structures must also set this field to a unique value which identifies that code. Third-party implementations of HFS Plus should place a registered creator code in this field. The value used by Mac OS 8.1 to 9.2.2 is '8.10'. The value used by Mac OS X is '10.0'. The value used by a journaled volume (including HFSX) in Mac OS X is 'HFSJ'. The value used by fsck_hfs on Mac OS X is 'fsck'. It is very important for implementations (and utilities that directly modify the volume!) to set the lastMountedVersion. It is also important to choose different values when non-trivial changes are made to an implementation or utility. If a bug is found in an implementation or utility, and it sets the lastMountedVersion correctly, it will be much easier for other implementations and utilities to detect and correct any problems. The allocation block number of the allocation block which contains the JournalInfoBlock for this volume's journal. This field is valid only if bit kHFSVolumeJournaledBit is set in the attribute field; otherwise, this field is reserved. The date and time when the volume was created. See HFS Plus Dates for a description of the format. The date and time when the volume was last modified. See HFS Plus Dates for a description of the format. The date and time when the volume was last backed up. The volume format requires no special action on this field; it simply defines the field for the benefit of user programs. See HFS Plus Dates for a description of the format. The date and time when the volume was last checked for consistency. Disk checking tools, such as Disk First Aid, must set this when they perform a disk check. A disk checking tool may use this date to perform periodic checking of a volume. The total number of files on the volume. The fileCount field does not include the special files. It should equal the number of file records found in the catalog file. The total number of folders on the volume. ThefolderCount field does not include the root folder. It should equal the number of folder records in the catalog file, minus one (since the root folder has a folder record in the catalog file). The allocation block size, in bytes. The total number of allocation blocks on the disk. For a disk whose size is an even multiple of the allocation block size, all areas on the disk are included in an allocation block, including the volume header and alternate volume header. For a disk whose size is not an even multiple of the allocation block size, only the allocation blocks that will fit entirely on the disk are counted here. The remaining space at the end of the disk is not used by the volume format (except for storing the alternate volume header, as described above). The total number of unused allocation blocks on the disk. Start of next allocation search. The nextAllocation field is used by Mac OS as a hint for where to start searching for free allocation blocks when allocating space for a file. It contains the allocation block number where the search should begin. An implementation that doesn't want to use this kind of hint can just treat the field as reserved. [Implementation details: traditional Mac OS implementations typically set it to the first allocation block of the extent most recently allocated. It is not set to the allocation block immediately following the most recently allocated extent because of the likelihood of that extent being shortened when the file is closed (since a whole clump may have been allocated but not actually used).] See Allocation File section for details. The default clump size for resource forks, in bytes. This is a hint to the implementation as to the size by which a growing file should be extended. All Apple implementations to date ignore the rsrcClumpSize and use dataClumpSize for both data and resource forks. The default clump size for data forks, in bytes. This is a hint to the implementation as to the size by which a growing file should be extended. All Apple implementations to date ignore the rsrcClumpSize and use dataClumpSize for both data and resource forks. The next unused catalog ID. See Catalog File for a description of catalog IDs. This field is incremented every time a volume is mounted. This allows an implementation to keep the volume mounted even when the media is ejected (or otherwise inaccessible). When the media is re-inserted, the implementation can check this field to determine when the media has been changed while it was ejected. It is very important that an implementation or utility change the writeCount field if it modifies the volume's structures directly. This is particularly important if it adds or deletes items on the volume. This field keeps track of the text encodings used in the file and folder names on the volume. This bitmap enables some performance optimizations for implementations that don't use Unicode names directly. See the Text Encoding sections for details. This array of 32-bit items contains information used by the Mac OS Finder, and the system software boot process. finderInfo contains the directory ID of the directory containing the bootable system (for example, the System Folder in Mac OS 8 or 9, or /System/Library/CoreServices in Mac OS X). It is zero if there is no bootable system on the volume. This value is typically equal to either finderInfo or finderInfo. finderInfo contains the parent directory ID of the startup application (for example, Finder), or zero if the volume is not bootable. finderInfo contains the directory ID of a directory whose window should be displayed in the Finder when the volume is mounted, or zero if no directory window should be opened. In traditional Mac OS, this is the first in a linked list of windows to open; the frOpenChain field of the directory's Finder Info contains the next directory ID in the list. The open window list is deprecated. The Mac OS X Finder will open this directory's window, but ignores the rest of the open window list. The Mac OS X Finder does not modify this field. finderInfo contains the directory ID of a bootable Mac OS 8 or 9 System Folder, or zero if there isn't one. finderInfo contains the directory ID of a bootable Mac OS X system (the /System/Library/CoreServices directory), or zero if there is no bootable Mac OS X system on the volume. finderInfo and finderInfo are used by Mac OS X to contain a 64-bit unique volume identifier. One use of this identifier is for tracking whether a given volume's ownership (user ID) information should be honored. These elements may be zero if no such identifier has been created for the volume. Information about the location and size of the allocation file. See Fork Data Structure for a description of the HFSPlusForkData type. Information about the location and size of the extents file. See Fork Data Structure for a description of the HFSPlusForkData type. Information about the location and size of the catalog file. See Fork Data Structure for a description of the HFSPlusForkData type. Information about the location and size of the attributes file. See Fork Data Structure for a description of the HFSPlusForkData type. Information about the location and size of the startup file. See Fork Data Structure for a description of the HFSPlusForkData type. The attributes field of a volume header is treated as a set of one-bit flags. The definition of the bits is given by the constants listed below. An implementation must treat these as reserved fields. This bit is set if the volume was correctly flushed before being unmounted or ejected. An implementation must clear this bit on the media when it mounts a volume for writing. An implementation must set this bit on the media as the last step of unmounting a writable volume, after all other volume information has been flushed. If an implementation is asked to mount a volume where this bit is clear, it must assume the volume is inconsistent, and do appropriate consistency checking before using the volume. This bit is set if there are any records in the extents overflow file for bad blocks (belonging to file ID kHFSBadBlockFileID). See Bad Block File for details. This bit is set if the blocks from this volume should not be cached. For example, a RAM or ROM disk is actually stored in memory, so using additional memory to cache the volume's contents would be wasteful. This bit is similar to kHFSVolumeUnmountedBit, but inverted in meaning. An implementation must set this bit on the media when it mounts a volume for writing. An implementation must clear this bit on the media as the last step of unmounting a writable volume, after all other volume information has been flushed. If an implementation is asked to mount a volume where this bit is set, it must assume the volume is inconsistent, and do appropriate consistency checking before using the volume. This bit is set when the nextCatalogID field overflows 32 bits, forcing smaller catalog node IDs to be reused. When this bit is set, it is common (and not an error) for catalog records to exist with IDs greater than or equal to nextCatalogID. If this bit is set, you must ensure that IDs assigned to newly created catalog records do not conflict with IDs used by existing records. If this bit is set, the volume has a journal, which can be located using the journalInfoBlock field of the Volume Header. An implementation must treat this bit as reserved. This bit is set if the volume is write-protected due to a software setting. Any implementations must refuse to write to a volume with this bit set. This flag is especially useful for write-protecting a volume on a media that cannot be write-protected otherwise, or for protecting an individual partition on a partitioned device. An implementation must treat these bits as reserved. An implementation may keep a copy of the attributes in memory and use bits 0-7 for its own runtime flags. As an example, Mac OS uses bit 7, kHFSVolumeHardwareLockBit, to indicate that the volume is write-protected due to some hardware setting. The existence of two volume consistency bits (kHFSVolumeUnmountedBit and kHFSBootVolumeInconsistentBit) deserves an explanation. Macintosh ROMs check the consistency of a boot volume if kHFSVolumeUnmountedBit is clear. The ROM-based check is very slow, annoyingly so. This checking code was significantly optimized in Mac OS 7.6. To prevent the ROM check from being used, Mac OS 7.6 (and higher) leaves the original consistency check bit (kHFSVolumeUnmountedBit) set at all times. Instead, an alternative flag (kHFSBootVolumeInconsistentBit) is used to signal that the disk needs a consistency check. For a practical description of the algorithms used to maintain a B-tree, see Algorithms in C , Robert Sedgewick, Addison-Wesley, 1992. ISBN: 0201514257. HFS and HFS Plus are slightly different; in a given subtree, there are no keys less than the first key of that subtree's root node. This section describes the B-tree structure used for the catalog, extents overflow, and attributes files. A B-tree is stored in file data fork. Each B-tree has a HFSPlusForkData structure in the volume header that describes the size and initial extents of that data fork. Special files do not have a resource fork because there is no place to store its HFSPlusForkData in the volume header. However, it's still important that the B-tree is in the data fork because the fork is part of the key used to store B-tree extents in the extents overflow file. A B-tree file is divided up into fixed-size nodes, each of which contains records, which consist of a key and some data. The purpose of the B-tree is to efficiently map a key into its corresponding data. To achieve this, keys must be ordered, that is, there must be a well-defined way to decide whether one key is smaller than, equal to, or larger than another key. The node size (which is expressed in bytes) must be power of two, from 512 through 32,768, inclusive. The node size of a B-tree is determined when the B-tree is created. The logical length of a B-tree file is just the number of nodes times the node size. There are four kinds of nodes. Each B-tree contains a single header node. The header node is always the first node in the B-tree. It contains the information needed to find other any other node in the tree. Map nodes contain map records, which hold any allocation data (a bitmap that describes the free nodes in the B-tree) that overflows the map record in the header node. Index nodes hold pointer records that determine the structure of the B-tree. Leaf nodes hold data records that contain the data associated with a given key. The key for each data record must be unique. All nodes share a common structure, described in the next section. Nodes are indicated by number. The node's number can be calculated by dividing its offset into the file by the node size. Each node has the same general structure, consisting of three main parts: a node descriptor at the beginning of the node, a list of record offsets at the end of the node, and a list of records. This structure is depicted in Figure 2. Figure 2. The structure of a node. The node descriptor contains basic information about the node as well as forward and backward links to other nodes. The BTNodeDescriptor data type describes this structure. The node number of the next node of this type, or 0 if this is the last node. The node number of the previous node of this type, or 0 if this is the first node. The type of this node. There are four node kinds, defined by the constants listed below. The number of records contained in this node. An implementation must treat this as a reserved field. A node descriptor is always 14 (which is sizeof(BTNodeDescriptor)) bytes long, so the list of records contained in a node always starts 14 bytes from the start of the node. The size of each record can vary, depending on the record's type and the amount of information it contains. The records are accessed using the list of record offsets at the end of the node. Each entry in this list is a UInt16 which contains the offset, in bytes, from the start of the node to the start of the record. The offsets are stored in reverse order, with the offset for the first record in the last two bytes of the node, the offset for the second record is in the previous two bytes, and so on. Since the first record is always at offset 14, the last two bytes of the node contain the value 14. The list of record offsets always contains one more entry than there is records in the node. This entry contains the offset to the first byte of free space in the node, and thus indicates the size of the last record in the node. If there is no free space in the node, the entry contains its own byte offset from the start of the node. It's important to realise that the B-tree node type determines the type of records found in the node. Leaf nodes always contain data records. Index nodes always contain pointer records. Map nodes always contain map records. The header node always contains a header record, a reserved record, and a map record. The four node types and their corresponding records are described in the subsequent sections. The first node (node 0) in every B-tree file is a header node, which contains essential information about the entire B-tree file. There are three records in the header node. The first record is the B-tree header record. The second record is the user data record and is always 128 bytes long. 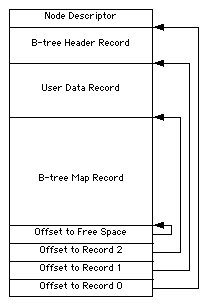 The last record is the B-tree map record; it occupies all of the remaining space between the user data record and the record offsets. The header node is shown in Figure 3. The fLink field of the header node's node descriptor contains the node number of the first map node, or 0 if there are no map nodes. The bLink field of the header node's node descriptor must be set to zero. The B-tree header record contains general information about the B-tree such as its size, maximum key length, and the location of the first and last leaf nodes. The data type BTHeaderRec describes the structure of a header record. The root node can be a leaf node (in the case where there is only a single leaf node, and therefore no index nodes, as might happen with the catalog file on a newly initialized volume). If a tree has no leaf nodes (like the extents overflow file on a newly initialized volume), the firstLeafNode, lastLeafNode, and rootNode fields will all be zero. If there is only one leaf node (as may be the case with the catalog file on a newly initialized volume), firstLeafNode, lastLeafNode, and rootNode will all have the same value (i.e., the node number of the sole leaf node). The firstLeafNode and lastLeafNode fields just make it easy to walk through all the leaf nodes by just following fLink/bLink fields. The current depth of the B-tree. Always equal to the height field of the root node. The node number of the root node, the index node that acts as the root of the B-tree. See Index Nodes for details. There is a possibility that the rootNode is a leaf node. See Inside Macintosh: Files, pp. 2-69 for details. The total number of records contained in all of the leaf nodes. The node number of the first leaf node. This may be zero if there are no leaf nodes. The node number of the last leaf node. This may be zero if there are no leaf nodes. The size, in bytes, of a node. This is a power of two, from 512 through 32,768, inclusive. The maximum length of a key in an index or leaf node. HFSVolumes.h has the maxKeyLength values for the catalog and extents files for both HFS and HFS Plus (kHFSPlusExtentKeyMaximumLength, kHFSExtentKeyMaximumLength, kHFSPlusCatalogKeyMaximumLength, kHFSCatalogKeyMaximumLength). The maximum key length for the attributes B-tree will probably be a little larger than for the catalog file. In general, maxKeyLength has to be small enough (compared to nodeSize) so that a single node can fit two keys of maximum size plus the node descriptor and offsets. The total number of nodes (be they free or used) in the B-tree. The length of the B-tree file is this value times the nodeSize. The number of unused nodes in the B-tree. Ignored for HFS Plus B-trees. The clumpSize field of the HFSPlusForkData record is used instead. For maximum compatibility, an implementation should probably set the clumpSize in the node descriptor to the same value as the clumpSize in the HFSPlusForkData when initializing a volume. Otherwise, it should treat the header records's clumpSize as reserved. This field must be equal to kHFSBTreeType for the catalog, extents, and attributes B-trees. This field must be equal to kUserBTreeType for the hot file B-tree. Historically, values of 1 to 127 and kReservedBTreeType were used in B-trees used by system software in Mac OS 9 and earlier. For HFSX volumes, this field in the catalog B-tree header defines the ordering of the keys (whether the volume is case-sensitive or case-insensitive). In all other cases, an implementation must treat this as a reserved field. A set of bits used to describe various attributes of the B-tree. The meaning of these bits is given below. The following constants define the various bits that may be set in the attributes field of the header record. This bit indicates that the B-tree was not closed properly and should be checked for consistency. This bit is not used for HFS Plus B-trees. An implementation must treat this as reserved. If this bit is set, the keyLength field of the keys in index and leaf nodes is UInt16; otherwise, it is a UInt8. This bit must be set for all HFS Plus B-trees. If this bit is set, the keys in index nodes occupy the number of bytes indicated by their keyLength field; otherwise, the keys in index nodes always occupy maxKeyLength bytes. This bit must be set for the HFS Plus Catalog B-tree, and cleared for the HFS Plus Extents B-tree. Bits not specified here must be treated as reserved. The second record in a header node is always 128 bytes long. It provides a small space to store information associated with a B-tree. In the HFS Plus catalog, extents, and attributes B-trees, this record is unused and reserved. In the HFS Plus hot file B-tree, this record contains general information about the hot file recording process. The remaining space in the header node is occupied by a third record, the map record. It is a bitmap that indicates which nodes in the B-tree are used and which are free. The bits are interpreted in the same way as the bits in the allocation file. All tolled, the node descriptor, header record, reserved record, and record offsets occupy 256 bytes of the header node. So the size of the map record (in bytes) is nodeSize minus 256. If there are more nodes in the B-tree than can be represented by the map record in the header node, map nodes are used to store additional allocation data. If the map record of the header node is not large enough to represent all of the nodes in the B-tree, map nodes are used to store the remaining allocation data. In this case, the fLink field of the header node's node descriptor contains the node number of the first map node. A map node consists of the node descriptor and a single map record. The map record is a continuation of the map record contained in the header node. The size of the map record is the size of the node, minus the size of the node descriptor (14 bytes), minus the size of two offsets (4 bytes), minus two bytes of free space. That is, the size of the map record is the size of the node minus 20 bytes; this keeps the length of the map record an even multiple of 4 bytes. Note that the start of the map record is not aligned to a 4-byte boundary: it starts immediately after the node descriptor (at an offset of 14 bytes). The B-tree uses as many map nodes as needed to provide allocation data for all of the nodes in the B-tree. The map nodes are chained through the fLink fields of their node descriptors, starting with the header node. The fLink field of the last map node's node descriptor is zero. The bLink field is not used for map nodes and must be set to zero for all map nodes. Not using the bLink field is consistent with the HFS volume format, but not really consistent with the overall design. The records in index and leaf nodes share a common structure. They contain a keyLength, followed by the key itself, followed by the record data. The first part of the record, keyLength, is either a UInt8 or a UInt16, depending on the attributes field in the B-tree's header record. If the kBTBigKeysMask bit is set in attributes, the keyLength is a UInt16; otherwise, it's a UInt8. The length of the key, as stored in this field, does not include the size of the keyLength field itself. All HFS Plus B-trees use a UInt16 for their key length. Immediately following the keyLength is the key itself. The length of the key is determined by the node type and the B-tree attributes. In leaf nodes, the length is always determined by keyLength. In index nodes, the length depends on the value of the kBTVariableIndexKeysMask bit in the B-tree attributes in the header record. If the bit is clear, the key occupies a constant number of bytes, determined by the maxKeyLength field of the B-tree header record. If the bit is set, the key length is determined by the keyLength field of the keyed record. Following the key is the record's data. The format of this data depends on the node type, as explained in the next two sections. However, the data is always aligned on a two-byte boundary and occupies an even number of bytes. To meet the first alignment requirement, a pad byte must be inserted between the key and the data if the size of the keyLength field plus the size of the key is odd. To meet the second alignment requirement, a pad byte must be added after the data if the data size is odd. The records in an index node are called pointer records. They contain a keyLength, a key, and a node number, expressed a UInt32. The node whose number is in a pointer record is called a child node of the index node. An index node has two or more children, depending on the size of the node and the size of the keys in the node. A root node does not need to exist (if the tree is empty). And even if one does exist, it need not be an index node (i.e., it could be a leaf node if all the records fit in a single node). The bottom level of a B-tree is occupied exclusively by leaf nodes, which contain data records instead of pointer records. The data records contain a keyLength, a key, and the data associated with that key. The data may be of variable length. In an HFS Plus B-tree, the data in the data record is the HFS Plus volume structure (such as a CatalogRecord, ExtentRecord, or AttributeRecord) associated with the key. Keyed records must be placed in a node such that their keys are in ascending order. All the nodes in a given level (whose height field is the same) must be chained via their fLink and bLink field. The node with the smallest keys must be first in the chain and its bLink field must be zero. The node with the largest keys must be last in the chain and its fLink field must be zero. For any given node, all the keys in the node must be less than all the keys in the next node in the chain (pointed to by fLink). Similarly, all the keys in the node must be greater than all the keys in the previous node in the chain (pointed to by bLink). Keeping the keys ordered in this way makes it possible to quickly search the B-tree to find the data associated with a given key. Figure 4 shows a sample B-tree containing hypothetical keys (in this case, the keys are simply integers). When an implementation needs to find the data associated with a particular search key, it begins searching at the root node. Starting with the first record, it searches for the record with the greatest key that is less than or equal to the search key. In then moves to the child node (typically an index node) and repeats the same process. This process continues until a leaf node is reached. If the key found in the leaf node is equal to the search key, the found record contains the desired data associated with the search key. If the found key is not equal to the search key, the search key is not present in the B-tree. The structure of the B-trees on an HFS Plus volume is a closely related to the B-tree structure used on an HFS volume. There are three principal differences: the size of nodes, the size of keys within index nodes, and the size of a key length (UInt8 vs. UInt16). In an HFS B-tree, nodes always have a fixed size of 512 bytes. In an HFS Plus B-tree, the node size is determined by a field (nodeSize) in the header node. The node size must be a power from 512 through 32,768. An implementation must use the nodeSize field to determine the actual node size. The header node is always located at the start of the B-tree, so you can find it without knowing the B-tree node size. These sizes are set when the volume is initialized and cannot be easily changed. It is legal to initialize an HFS Plus volume with different node sizes, but the node sizes must be large enough for an index node to contain two keys of maximum size (plus the other overhead such as a node descriptor, record offsets, and pointers to children). The node size of the catalog file must be at least kHFSPlusCatalogMinNodeSize (4096). The node size of the attributes file must be at least kHFSPlusAttrMinNodeSize (4096). In an HFS B-tree, all of the keys in an index node occupy a fixed amount of space: the maximum key length for that B-tree. This simplifies the algorithms for inserting and deleting records because, within an index node, one key can be replaced by another key without worrying whether there is adequate room for the new key. However, it is also somewhat wasteful when the keys are variable length (such as in the catalog file, where the key length varies with the length of the file name). In an HFS Plus B-tree, the keys in an index node are allowed to vary in size. This complicates the algorithms for inserting and deleting records, but reduces wasted space when the length of a key can vary (such as in the catalog file). It also means that the number of keys in an index node will vary with the actual size of the keys. HFS Plus uses a catalog file to maintain information about the hierarchy of files and folders on a volume. A catalog file is organized as a B-tree file, and hence consists of a header node, index nodes, leaf nodes, and (if necessary) map nodes. The location of the first extent of the catalog file (and hence of the file's header node) is stored in the volume header. From the catalog file's header node, an implementation can obtain the node number of the root node of the B-tree. From the root node, an implementation can search the B-tree for keys, as described in the previous section. The B-Trees chapter defined a standard rule for the node size of HFS Plus B-trees. As the catalog file is a B-tree, it inherits the requirements of this rule. In addition, the node size of the catalog file must be at least 4 KB (kHFSPlusCatalogMinNodeSize). Each file or folder in the catalog file is assigned a unique catalog node ID (CNID). For folders, the CNID is the folder ID, sometimes called a directory ID, or dirID; for files, it's the file ID. For any given file or folder, the parent ID is the CNID of the folder containing the file or folder, known as the parent folder. The catalog node ID is defined by the CatalogNodeID data type. Parent ID of the root folder. Folder ID of the root folder. File ID of the extents overflow file. File ID of the catalog file. File ID of the bad block file. The bad block file is not a file in the same sense as a special file and a user file. See Bad Block File for details. File ID of the allocation file (introduced with HFS Plus). File ID of the startup file (introduced with HFS Plus). File ID of the attributes file (introduced with HFS Plus). Used temporarily by fsck_hfs when rebuilding the catalog file. Used temporarily during ExchangeFiles operations. First CNID available for use by user files and folders. In addition, the CNID of zero is never used and serves as a nil value. Typically, CNIDs are allocated sequentially, starting at kHFSFirstUserCatalogNodeID. Versions of the HFS Plus specification prior to Jan. 18, 2000, required the nextCatalogID field of the volume header to be greater than the largest CNID used on the volume (so that an implementation could use nextCatalogID to determine the CNID to assign to a newly created file or directory). However, this can be a problem for volumes that create files or directories at a high rate (for example, a busy server), since they might run out of CNID values. HFS Plus volumes now allow CNID values to wrap around and be reused. The kHFSCatalogNodeIDsReusedBit in the attributes field of the volume header is set to indicate when CNID values have wrapped around and been reused. When kHFSCatalogNodeIDsReusedBit is set, the nextCatalogID field is no longer required to be greater than any existing CNID. When kHFSCatalogNodeIDsReusedBit is set, nextCatalogID may still be used as a hint for the CNID to assign to newly created files or directories, but the implementation must verify that CNID is not currently in use (and pick another value if it is in use). When CNID number nextCatalogID is already in use, an implementation could just increment nextCatalogID until it finds a CNID that is not in use. If nextCatalogID overflows to zero, kHFSCatalogNodeIDsReusedBit must be set and nextCatalogID set to kHFSFirstUserCatalogNodeID (to avoid using any reserved CNID values). Mac OS X versions 10.2 and later, and all versions of Mac OS 9 support kHFSCatalogNodeIDsReusedBit. the format of the leaf node data records (file, folder, and thread records). For a given file, folder, or thread record, the catalog file key consists of the parent folder's CNID and the name of the file or folder. This structure is described using the HFSPlusCatalogKey type. The keyLength field is required by all keyed records in a B-tree. The catalog file, in common with all HFS Plus B-trees, uses a large key length (UInt16). For file and folder records, this is the folder containing the file or folder represented by the record. For thread records, this is the CNID of the file or folder itself. This field contains Unicode characters, fully decomposed and in canonical order. For file or folder records, this is the name of the file or folder inside the parentID folder. For thread records, this is the empty string. The length of the key varies with the length of the string stored in the nodeName field; it occupies only the number of bytes required to hold the name. The keyLength field determines the actual length of the key; it varies between kHFSPlusCatalogKeyMinimumLength (6) to kHFSPlusCatalogKeyMaximumLength (516). The catalog file key mirrors the standard way you specify a file or folder with the Mac OS File Manager programming interface, with the exception of the volume reference number, which determines which volume's catalog to search. Catalog file keys are compared first by parentID and then by nodeName. The parentID is compared as an unsigned 32-bit integer. For case-sensitive HFSX volumes, the characters in nodeName are compared as a sequence of unsigned 16-bit integers. For case-insensitive HFSX volumes and HFS Plus volumes, the nodeName must be compared in a case-insensitive way, as described in the Case-Insensitive String Comparison Algorithm section. For more information about how catalog keys are used to find file, folder, and thread records within the catalog tree, see Catalog Tree Usage. A folder record contains information about a single folder. A file record contains information about a single file. A folder thread record provides a link between a folder and its parent folder, and lets you find a folder record given just the folder ID. This record is a folder record. You can use the HFSPlusCatalogFolder type to interpret the data. This record is a file record. You can use the HFSPlusCatalogFile type to interpret the data. This record is a folder thread record. You can use the HFSPlusCatalogThread type to interpret the data. This record is a file thread record. You can use the HFSPlusCatalogThread type to interpret the data. The next three sections describe the folder, file, and thread records in detail. The position of the recordType field, and the constants chosen for the various record types, are especially useful if you're writing common code to handle HFS and HFS Plus volumes. In HFS, the record type field is one byte, but it's always followed by a one-byte reserved field whose value is always zero. In HFS Plus, the record type field is two bytes. You can use the HFS Plus two-byte record type to examine an HFS record if you use the appropriate constants, as shown below. This record is an HFS folder record. You can use the HFSCatalogFolder type to interpret the data. This record is an HFS file record. You can use the HFSCatalogFile type to interpret the data. This record is an HFS folder thread record. You can use the HFSCatalogThread type to interpret the data. This record is an HFS file thread record. You can use the HFSCatalogThread type to interpret the data. The catalog folder record is used in the catalog B-tree file to hold information about a particular folder on the volume. The data of the record is described by the HFSPlusCatalogFolder type. The catalog data record type. For folder records, this is always kHFSPlusFolderRecord. This field contains bit flags about the folder. No bits are currently defined for folder records. An implementation must treat this as a reserved field. The number of files and folders directly contained by this folder. This is equal to the number of file and folder records whose key's parentID is equal to this folder's folderID. The traditional Mac OS File Manager programming interfaces require folders to have a valence less than 32,767. An implementation must enforce this restriction if it wants the volume to be usable by Mac OS. Values of 32,768 and larger are problematic; 32,767 and smaller are OK. It's an implementation restriction for the older Mac OS APIs; items 32,768 and beyond would be unreachable by PBGetCatInfo. As a practical matter, many programs are likely to fails with anywhere near that many items in a single folder. So, the volume format allows more than 32,767 items in a folder, but it's probably not a good idea to exceed that limit right now. The CNID of this folder. Remember that the key for a folder record contains the CNID of the folders parent, not the CNID of the folder itself. The date and time the folder was created. See HFS Plus Dates for a description of the format. Again, the createDate of the Volume Header is NOT stored in GMT; it is local time. (Further, if the volume has an HFS wrapper, the creation date in the MDB should be the same as the createDate in the Volume Header). The date and time the folder's contents were last changed. This is the time when a file or folder was created or deleted inside this folder, or when a file or folder was moved in or out of this folder. See HFS Plus Dates for a description of the format. The traditional Mac OS APIs use the contentModDate when getting and setting the modification date. The traditional Mac OS APIs treat attributeModDate as a reserved field. The last date and time that any field in the folder's catalog record was changed. An implementation may treat this field as reserved. In Mac OS X, the BSD APIs use this field as the folder's change time (returned in the st_ctime field of struct stat). All versions of Mac OS 8 and 9 treat this field as reserved. See HFS Plus Dates for a description of the format. The date and time the folder's contents were last read. This field has no analog in the HFS catalog record. It represents the last time the folder's contents were read. This field exists to support POSIX semantics when the volume is mounted on Mac OS X and some non-Mac OS platforms. See HFS Plus Dates for a description of the format. The traditional Mac OS implementation of HFS Plus does not maintain the accessDate field. Folders created by traditional Mac OS have an accessDate of zero. The date and time the folder was last backed up. The volume format requires no special action on this field; it simply defines the field for the benefit of user programs. See HFS Plus Dates for a description of the format. This field contains folder permissions, similar to those defined by POSIX or AFP. See HFS Plus Permissions for a description of the format. The traditional Mac OS implementation of HFS Plus does not use the permissions field. Folders created by traditional Mac OS have the entire field set to 0. This field contains information used by the Mac OS Finder. The contents of this structure are not strictly part of the HFS Plus specification, but general information is in the Finder Info section of this note. A hint as to text encoding from which the folder name was derived. This hint can be used to improve the quality of the conversion of the name to a Mac OS-encoded Pascal string. See Text Encodings for details. The catalog file record is used in the catalog B-tree file to hold information about a particular file on the volume. The data of the record is described by the HFSPlusCatalogFile type. The catalog data record type. For files records, this is always kHFSPlusFileRecord. This field contains bit flags about the file. The currently defined bits are described below. An implementation must treat undefined bits as reserved. The CNID of this file. The date and time the file was created. See HFS Plus Dates for a description of the format. The date and time the file's contents were last changed by extending, truncating, or writing either of the forks. See HFS Plus Dates for a description of the format. The last date and time that any field in the file's catalog record was changed. An implementation may treat this field as reserved. In Mac OS X, the BSD APIs use this field as the file's change time (returned in the st_ctime field of struct stat). All versions of Mac OS 8 and 9 treat this field as reserved. See HFS Plus Dates for a description of the format. The date and time the file's contents were last read. This field has no analog in the HFS catalog record. It represents the last time either of a file's forks was read. This field exists to support POSIX semantics when the volume is mounted on Mac OS X and some non-Mac OS platforms. See HFS Plus Dates for a description of the format. The traditional Mac OS implementation of HFS Plus does not maintain the accessDate field. Files created by traditional Mac OS have an accessDate of zero. The date and time the file was last backed up. The volume format requires no special action on this field; it simply defines the field for the benefit of user programs. See HFS Plus Dates for a description of the format. This field contains file permissions, similar to those defined by POSIX. See HFS Plus Permissions for a description of the format. The traditional Mac OS implementation of HFS Plus does not use the permissions field. Files created by traditional Mac OS have the entire field set to 0. This field contains information used by the Mac OS Finder. For more information, see the Finder Info section of this note. A hint as to text encoding from which the file name was derived. This hint can be used to improved the quality of the conversion of the name to a Mac OS encoded Pascal string. See Text Encodings for details. Information about the location and size of the data fork. See Fork Data Structure for a description of the HFSPlusForkData type. Information about the location and size of the resource fork. See Fork Data Structure for a description of the HFSPlusForkData type. For each fork, the first eight extents are described by the HFSPlusForkData field in the catalog file record. If a fork is sufficiently fragmented to require more than eight extents, the remaining extents are described by extent records in the extents overflow file. If kHFSFileLockedBit is set, then none of the forks may be extended, truncated, or written to. They may only be opened for reading (not for writing). The catalog information (like finderInfo and userInfo) may still be changed. This bit incidates that the file has a thread record. As all files in HFS Plus have thread records, this bit must be set. The catalog thread record is used in the catalog B-tree file to link a CNID to the file or folder record using that CNID. The data of the record is described by the HFSPlusCatalogThread type. In HFS, thread records were required for folders but optional for files. In HFS Plus, thread records are required for both files and folders. The catalog data record type. For thread records, this is kHFSPlusFileRecord or kHFSPlusFolderRecord, depending on whether the thread record refers to a file or a folder. Both types of thread record contain the same data. The CNID of the parent of the file or folder referenced by this thread record. The name of the file or folder referenced by this thread record. The next section explains how thread records can be used to find a file or folder using just its CNID. File and folder records always have a key that contains a non-empty nodeName. The file and folder records for the children are all consecutive in the catalog, since they all have the same parentID in the key, and vary only by nodeName. The key for a thread record is the file's or folder's CNID (not the CNID of the parent folder) and an empty (zero length) nodeName. This allows a file or folder to by found using just the CNID. The thread record contains the parentID and nodeName field of the file or folder itself. Finding a file or folder by its CNID is a two-step process. The first step is to use the CNID to look up the thread record for the file or folder. This yields the file or folder's parent folder ID and name. The second step is to use that information to look up the real file or folder record. Since files do not contain other files or folders, there are no catalog records whose key has a parentID equal to a file's CNID and nodeName with non-zero length. These unused key values are reserved. See the Finder Interface Reference for more detailed information about these data types and how the Finder uses them. HFS Plus tracks which allocation blocks belong to a file's forks by maintaining a list of extents (contiguous allocation blocks) that belong to that file, in the appropriate order. Each extent is represented by a pair of numbers: the first allocation block number of the extent and the number of allocation blocks in the extent. The file record in the catalog B-tree contains a record of the first eight extents of each fork. If there are more than eight extents in a fork, the remaining extents are stored in the extents overflow file. Fork Data Structure discusses how HFS Plus maintains information about a fork. Like the catalog file, the extents overflow file is B-tree. However, the structure of the extents overflow file is relatively simple compared to that of a catalog file. The extents overflow file has a simple, fixed length key and a single type of data record. The structure of the key for the extents overflow file is described by the HFSPlusExtentKey type. The keyLength field is required by all keyed records in a B-tree. The extents overflow file, in common with all HFS Plus B-trees, uses a large key length (UInt16). Keys in the extents overflow file always have the same length, kHFSPlusExtentKeyMaximumLength (10). The type of fork for which this extent record applies. This must be either 0 for the data fork or 0xFF for the resource fork. An implementation must treat this as a pad field. The CNID of the file for which this extent record applies. The offset, in allocation blocks, into the fork of the first extent described by this extent record. The startBlock field lets you directly find the particular extents for a given offset into a fork. Typically, an implementation will keep a copy of the initial extents from the catalog record. When trying to access part of the fork, they see whether that position is beyond the extents described in the catalog record; if so, they use that offset (in allocation blocks) to find the appropriate extents B-tree record. See Extents Overflow File Usage for more information. Two HFSPlusExtentKey structures are compared by comparing their fields in the following order: fileID, forkType, startBlock. Thus, all the extent records for a particular fork are grouped together in the B-tree, right next to all the extent records for the other fork of the file. The data records for an extents overflow file (the extent records) are described by the HFSPlusExtentRecord type, which is described in detail in Fork Data Structure. Remember that the HFSPlusExtentRecord contains descriptors for eight extents. The first eight extents in a fork are held in its catalog file record. So the number of extent records for a fork is ((number of extents - 8 + 7) / 8). The most important thing to remember about extents overflow file is that it is only used for forks with more than eight extents. In most cases, forks have fewer extents, and all the extents information for the fork is held in its catalog file record. However, for more fragmented forks, the extra extents information is stored in the extents overflow file. When an implementation needs to map a fork offset into a position on disk, it first looks through the extent records in the catalog file record. If the fork offset is within one these extents, the implementation can find the corresponding position without consulting the extents overflow file. If, on the other hand, the fork offset is beyond the last extent recorded in the catalog file record, the implementation must look in the next extent record, which is stored in the extents overflow file. To find this record, the implementation must form a key, which consists of information about the fork (the fork type and the file ID) and the offset info the fork (the start block). Because extent records are partially keyed off the fork offset of the first extent in the record, the implementation must have all the preceding extent records in order to know the fork offset to form the key of the next extent record. For example, if the fork has two extent records in the extents overflow file, the implementation must read the first extent record to calculate the fork offset for the key for the second extent record. We've got a fork with a total of 23 extents (very fragmented!). The blockCounts for the extents, in order, are as follows: one extent of 6 allocation blocks, 14 extents of one allocation block each, two extents of two allocation blocks each, one extent of 7 allocation blocks, and five more extents of one allocation block each. The fork contains a total of 36 allocation blocks. The block counts for the catalog's fork data are: 6, 1, 1, 1, 1, 1, 1, 1. There is an extent overflow record whose startBlock is 13 (0+6+1+1+1+1+1+1+1), and has the following block counts: 1, 1, 1, 1, 1, 1, 1, 2. There is a second extent overflow record whose startBlock is 22 (13+1+1+1+1+1+1+1+2), and has the following block counts: 2, 7, 1, 1, 1, 1, 1, 0. Note this last record only contains seven extents. Suppose the allocation block size for the volume is 4K. Suppose we want to start reading from the file at an offset of 108K. We want to know where the data is on the volume, and how much contiguous data is there. First, we divide 108K (the fork offset) by 4K (the allocation block size) to get 27, which is the number of allocation blocks from the start of the fork. So, we want to know where fork allocation block #27 is. We notice that 27 is greater than or equal to 13 (the number of allocation blocks in the catalog's fork data), so we're going to have to look in the extents B-tree. We construct a search key with the appropriate fileID and forkType, and set startBlock to 27 (the desired fork allocation block number). We then search the extents B-tree for the record whose key is less than or equal to our search key. We find the second extent overflow record (the one with startBlock=22). It has the same fileID and forkType, so things are good. Now we just need to figure out which extent within that record to use. We compute 27 (the desired fork allocation block) minus 22 (the startBlock) and get 5. So, we want the extent that is 5 allocation blocks "into" the record. We try the first extent. It's only two allocation blocks long, so the desired extent is 3 allocation blocks after that first extent in the record. The next extent is 7 allocation blocks long. Since 7 is greater than 3, we know the desired fork position is within this extent (the second extent in the second overflow record). Further, we know that there are 7-3=4 contiguous allocation blocks (i.e., 16K). The extent overflow file is also used to hold information about the bad block file. The bad block file is used to mark areas on the disk as bad, unable to be used for storing data. This is typically used to map out bad sectors on the disk. All space on an HFS Plus volume is allocated in terms of allocation blocks. Typically, allocation blocks are larger than sectors. If a sector is found to be bad, the entire allocation block is unusable. The bad block file is not a file in the same sense as a user file (it doesn't have a file record in the catalog) or one of the special files (it's not referenced by the volume header). Instead, the bad block file uses a special CNID (kHFSBadBlockFileID) as the key for extent records in the extents overflow file. When a block is marked as bad, an extent with this CNID and encompassing the bad block is added to the extents overflow file. The block is marked as used in the allocation file. These steps prevent the block from being used for data by the file system. The bad block file is necessary because marking a bad block as used in the allocation file is insufficient. One common consistency check for HFS Plus volumes is to verify that all the allocation blocks on the volume are being used by real data. If such a check were run on a volume with bad blocks that weren't also covered by extents in the bad block file, the bad blocks would be freed and might be reused for file system data. Bad block extent records are always assumed to reference the data fork. The forkType field of the key must be 0. Because an extent record holds up to eight extents, adding a bad block extent to the bad block file does not necessarily require the addition of a new extent record. HFS uses a similar mechanism to store information about bad blocks. This facility is used by the HFS Wrapper to hold an entire HFS Plus volume as bad blocks on an HFS disk. HFS Plus uses an allocation file to keep track of whether each allocation block in a volume is currently allocated to some file system structure or not. The contents of the allocation file is a bitmap. The bitmap contains one bit for each allocation block in the volume. If a bit is set, the corresponding allocation block is currently in use by some file system structure. If a bit is clear, the corresponding allocation block is not currently in use, and is available for allocation. HFS stores allocation information in a special area on the volume, known as the volume bitmap. The allocation file mechanism used by HFS Plus has a number of advantages. Using a file allows the bitmap itself to be allocated from allocation blocks. This simplifies the design, since volumes are now comprised of only one type of block -- the allocation block. The HFS is slightly more complex because it uses 512-byte blocks to hold the allocation bitmap and allocation blocks to hold file data. The allocation file does not have to be contiguous, which allows allocation information and user data to be interleaved. Many modern file systems do this to reduce head travel when growing files. The allocation file can be extended, which makes it significantly easier to increase the number of allocation blocks on a disk. This is useful if you want to either decrease the allocation block size on a disk, or increase the total disk size. The allocation file may be shrunk. This makes it easy to create a disk images suitable for volumes of varying sizes. The allocation file in the disk image is sized to hold enough allocation data for the largest disk, and shrunk back when the disk is written to a smaller disk. Each byte in the allocation file holds the state of eight allocation blocks. The byte at offset X into the file contains the allocation state of allocations blocks (X * 8) through (X * 8 + 7). Within each byte, the most significant bit holds information about the allocation block with the lowest number, the least significant bit holds information about the allocation block with the highest number. Listing 1 shows how you would test whether an allocation block is in use, assuming that you've read the entire allocation file into memory. Listing 1 Determining whether an allocation block is in use. The size of the allocation file depends on the number of allocation blocks in the volume, which in turn depends both on the size of the disk and on the size of the volume's allocation blocks. For example, a volume on a 1 GB disk and having an allocation block size of 4 KB needs an allocation file size of 256 Kbits (32 KB, or 8 allocation blocks). Since the allocation file itself is allocated using allocation blocks, it always occupies an integral number of allocation blocks (its size may be rounded up). The allocation file may be larger than the minimum number of bits required for the given volume size. Any unused bits in the bitmap must be set to zero. Since the number of allocation blocks is determined by a 32-bit number, the size of the allocation file can be up to 512 MB in size, a radical increase over HFS's 8 KB limit. Because the entire volume is composed of allocation blocks (with the possible exception of the alternate volume header, as described above), the volume header, alternate volume header, and reserved areas (the first 1024 bytes and the last 512 bytes) must be marked as allocated in the allocation file. The actual number of allocation blocks allocated for these areas varies with the size of the allocation blocks. Any allocation block that contains any of these areas must be marked allocated. For example, if 512-byte allocation blocks are used, the first three and last two allocation blocks are allocated. With 1024-byte allocation blocks, the first two and the last allocation blocks are allocated. For larger allocation block sizes, only the first and last allocation blocks are allocated for these areas. See the Volume Header section for a description of these areas. The HFS Plus attributes file is reserved for implementing named forks in the future. An attributes file is organized as a B-tree file. It a special file, described by an HFSPlusForkData record in the volume header, with no entry in the catalog file. An attributes files has a variable length key and three data record types, which makes it roughly as complex as the catalog file. It is possible for a volume to have no attributes file. If the first extent of the attributes file (stored in the volume header) has zero allocation blocks, the attributes file does not exist. The B-Trees chapter defined a standard rule for the node size of HFS Plus B-trees. As the attributes file is a B-tree, it inherits the requirements of this rule. In addition, the node size of the attributes file must be at least 4 KB (kHFSPlusAttrMinNodeSize). addition attribute's file data record types may be defined. An implementation written to this specification may use the details that are final to perform basic consistency checks on attributes. These checks will be compatible with future implementations written to a final attributes specification. See Attributes and the Allocation File Consistency Check. Several types of attributes file data records are defined. It is possible that additional record types will be defined in future specifications. Implementations written to this specification must ignore record types not defined here. Fork data attributes are used for attributes whose data is large. The attribute's data is stored in extents on the volume and the attribute merely contains a reference to those extents. Extension attributes augment fork data attributes, allowing an fork data attribute to have more than eight extents. Each record starts with a recordType field, which describes the type of attribute data record. The recordType field contains one of the following values. The next two sections describe the fork data and extension attributes in detail. A fork data attribute is defined by the HFSPlusAttrForkData data type. The attribute data record type. For fork data attributes, this is always kHFSPlusAttrForkData. Information about the location and size of the attribute data. See Fork Data Structure for a description of the HFSPlusForkData type. A extension attribute is defined by the HFSPlusAttrExtents data type. The attribute data record type. For extension attributes, this is always kHFSPlusAttrExtents. The eight extents of the attribute data described by this record. See Fork Data Structure for a description of the HFSPlusExtentRecord type. While the key structure for the attributes file is not fully specified, it is still possible for an implementation to use attribute file information in its allocation file consistency check. The leaf records of the attribute file are fully defined, so the implementation can simply iterate over them to determine which allocation blocks on the disk are being used by fork data attributes. See Allocation File Consistency Check for details. The startup file is a special file intended to hold information needed when booting a system that does not have built-in (ROM) support for HFS Plus. A boot loader can find the startup file without full knowledge of the HFS Plus volume format (B-trees, catalog file, and so on). Instead, the volume header contains the location of the first eight extents of the startup file. It is legal for the startup file to contain more than eight extents, and for the remaining extents to be placed in the extents overflow file. However, doing so defeats the purpose of the startup file. Mac OS does not use the startup file to boot from HFS Plus disks. Instead, it uses the HFS wrapper, as described later in this document. Hard links are a feature that allows multiple directory entries to refer to a single file's content. They are a way to give a single file multiple names, possibly in multiple directories. This section describes how Mac OS X implements hard links on HFS Plus volumes. The Mac OS X implementation of hard links on HFS Plus volumes was done using the existing metadata fields of the catalog records. This makes it possible to back up and restore a volume using hard links, by backing up and restoring individual files, without having to understand or interpret the hard links. An HFS Plus implementation may choose to automatically follow hard links, or not. Indirect node files exist in a special directory called the metadata directory. This directory exists in the volume's root directory. The name of the metadata directory is four null characters followed by the string "HFS+ Private Data". The directory's creation date is set to the creation date of the volume's root directory. The kIsInvisible and kNameLocked bits are set in the directory's Finder information. The icon location in the Finder info is set to the point (22460, 22460). These Finder info settings are not mandatory, but they tend to reduce accidental changes to the metadata directory. An implementation that automatically follows hard links should make the metadata directory inaccessable from its normal file system interface. The case-insensitive Unicode string comparison used by HFS Plus and case-insensitive HFSX sorts null characters after all other characters, so the metadata directory will typically be the last item in the root directory. On case-sensitive HFSX volumes, null characters sort before other characters, so the metadata directory will typically be the first item in the root directory. Indirect node files have a special identifying number called a link reference. The link reference is unique among indirect node files on a given volume. The link reference is not related to catalog node IDs. When a new indirect node file is created, it is assigned a new link reference randomly chosen from the range 100 to 1073741923. The file name of an indirect node file is the string "iNode" immediately followed by the link reference converted to decimal text, with no leading zeroes. For example, an indirect node file with link reference 123 would have the name "iNode123". An indirect node file must be a file, not a directory. Hard links to directories are not allowed because they could cause cycles in the directory hierarchy if a hard link pointed to one of its ancestor directories. The linkCount field in the permissions is an estimate of the number of links referring to this indirect node file. An implementation that understands hard links should increment this value when creating an additional link, and decrement the value when removing a link. However, some implementations (such as traditional Mac OS) do not understand hard links and may make changes that cause the linkCount to be inaccurate. Similarly, it is possible for a link to refer to an indirect node file that does not exist. When removing a link, an implementation should not allow the linkCount to underflow; if it is already zero, do not change it. The inode number returned by the POSIX stat or lstat routines in the st_ino field of the stat structure is actually the catalog node ID of the indirect node file, not the link reference mentioned above. The reason for using a separate link reference number, instead of a catalog node ID, is to allow hard links to be backed up and restored by utilities that are not specifically aware of hard links. As long as they preserve filenames, Finder info, and permissions, then the hard links will be preserved. The fileType and fileCreator fields of the userInfo in the catalog record of a hard link file must be set to kHardLinkFileType and kHFSPlusCreator, respectively. The hard link file's creation date should be set to the creation date of the metadata directory. The hard link file's creation date may also be set to the creation date of the volume's root directory (if it differs from the creation date of the metadata directory), though this is deprecated. The iNodeNum field in the permissions is set to the link reference of the indirect node file that the link refers to. For better compatibility with older versions of the Mac OS Finder, the kHasBeenInited flag should be set in the Finder flags. The other Finder information, and other dates in the catalog record are reserved. POSIX semantics allow an open file to be unlinked (deleted). These open but unlinked files are stored on HFS Plus volumes much like a hard link. When the open file is deleted, it is renamed and moved into the metadata directory. The new name is the string "temp" followed by the catalog node ID converted to decimal text. When the file is eventually closed, this temporary file may be removed. All such temporary files may be removed when repairing an unmounted HFS Plus volume. Opened but deleted files (which are now orphaned). Orphaned indirect node files (no hard links refer to them). Broken hard link (hard link exists, but indirect node file does not). Opened but deleted files are files whose names start with "temp", and are in the metadata directory. If the volume is not in use (not mounted, and not being used by any other utility), then these files can be deleted. Volumes with a journal, even one with no active transactions, may have opened but undeleted files that need to be deleted. Detecting an orphaned indirect node file, broken hard link, or incorrect link count requires finding all hard link files in the catalog, and comparing the number of found hard links for each link reference with the link count of the corresponding indirect node file. A hard link with a link reference equal to 0 is invalid. Such a hard link may be the result of a hard link being copied or restored by an implementation or utility that does not use the permissions in catalog records. It may be possible to repair the hard link by determining the proper link reference. Otherwise, the hard link should be deleted. Similar to a hard link, a symbolic link is a special kind of file that refers to another file or directory. A symbolic link stores the path name of the file or directory it refers to. On an HFS Plus volume, a symbolic link is stored as an ordinary file with special values in some of the fields of its catalog record. The pathname of the file being referred to is stored in the data fork. The file type in the fileMode field of the permissions is set to S_IFLNK. For compatibility with Carbon and Classic applications, the file type of a symbolic link is set to kSymLinkFileType, and the creator code is set to kSymLinkCreator. The resource fork of the symbolic link has zero length and is reserved. The pathname stored in a symbolic link is assumed to be a POSIX pathname, as used by the Mac OS X BSD and Cocoa programming interfaces. It is not a traditional Mac OS, or Carbon, pathname. The path is encoded in UTF-8. It must be a valid UTF-8 sequence, with no null (zero) bytes. The path may refer to another volume. The path need not refer to any existing file or directory. The path may be full or partial (with or without a leading forward slash). For maximum compatibility, the length of the path should be 1024 bytes or less. An HFS Plus volume may have an optional journal to speed recovery when mounting a volume that was not unmounted safely (for example, as the result of a power outage or crash). The journal makes it quick and easy to restore the volume structures to a consistent state, without having to scan all of the structures. The journal is used only for the volume structures and metadata; it does not protect the contents of a fork. A single change to the volume may require writing coordinated changes to many different places on the volume. If a failure happens after some, but not all, of the changes have been written, then the volume may be seriously damaged and may result in catastrophic loss of data. For example, creating a file or directory requires adding two records (the file or folder record, and its thread record) to the catalog B-tree. A leaf node may not have enough room for a new record, so it may have to be split. That means that some records will be removed from the existing node and put into a newly allocated node. This requires adding a new key and pointer to the index node that is the parent of the leaf being split (which might require splitting the index node, and so on). If a failure occurs after the split, but before the index node is updated, all of the items in the new node would become inaccessible. Recovery from this sort of damage is time consuming at best, and may be impossible. The purpose of the journal is to ensure that when a group of related changes are being made, that either all of those changes are actually made, or none of them are made. This is done by gathering up all of the changes, and storing them in a separate place (in the journal). Once the journal copy of the changes is completely written to disk, the changes can actually be written to their normal locations on disk. If a failure happens at that time, the changes can simply be copied from the journal to their normal locations. If a failure happens when the changes are being written to the journal, but before they are marked complete, then all of those changes are ignored. A group of related changes is called a transaction. When all of the changes of a transaction have been written to their normal locations on disk, that transaction has been committed, and is removed from the journal. The journal may contain several transactions. Copying changes from all transactions to their normal locations on disk is called replaying the journal. Implementations accessing a journaled volume with transactions must either refuse to access the volume, or replay the journal to be sure the volume is consistent. If the lastModifiedVersion field of the volume header does not match the signature of an implementation known to properly use and update the journal, then the journal must not be replayed (since it may no longer match the on-disk structures, and could cause corruption if replayed). If kHFSVolumeJournaledBit is set in the volume header's attributes field, the volume has a journal. The journal data stuctures consist of a journal info block, journal header, and journal buffer. The journal info block indicates the location and size of the journal header and journal buffer. The journal buffer is the space set aside to hold transactions. 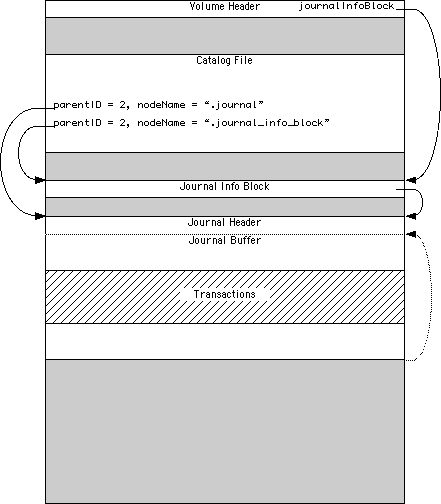 The journal header describes which part of the journal buffer is active and contains transactions waiting to be committed. Figure 7. Overview of an HFS Plus Journal. On HFS Plus volumes, the journal info block is stored as a file (so that its space can be properly represented in a catalog record and the allocation bitmap). The name of that file is ".journal_info_block" and it is stored in the volume's root directory. The journal header and journal buffer are stored together in a different file named ".journal", also in the volume's root directory. Each of these files are contiguous on disk (they occupy exactly one extent). An implementation that uses the journal must prevent the files from being accessed as normal files. An implementation must find the journal info block by using the journalInfoBlock field of the volume header, not by the file name. Similarly, an implementation must find the journal header and journal buffer using the contents of the journal info block, not the file name. A single transaction consists of several blocks, including both the data to be written, and the location where that data is to be written. This is represented on disk by a block list header, which describes the number and sizes of the blocks, immediately followed by the contents of those blocks. Figure 8. A Simple Transaction. Since block list headers are of limited size, a single transaction may consist of several block list headers and their associated block contents (one block list header followed by the contents of the blocks that header describes, then the next block list header and its block contents, and so on). 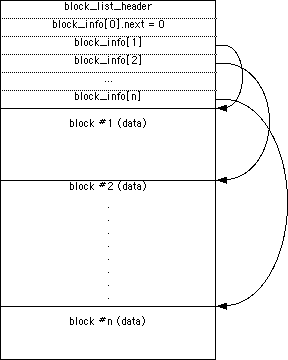 If the next field of the first block_info is non-zero, then the next block list header is a continuation of the same transaction. Figure 9. A Transaction with Multiple Block Lists. The journal buffer is treated as a circular buffer. When reading or writing the journal buffer, the I/O operation must stop at the end of the journal buffer and resume (wrap around) immediately following the journal header. Block list headers or the contents of blocks may wrap around in this way. Only a portion of the journal buffer is active at any given time; this portion is indicated by the start and end fields of the journal header. The part of the journal buffer that is not active contains no meaningful data, and must be ignored. To prevent ambiguity when start equals end, the journal is never allowed to be perfectly full (all of the journal buffer used by block lists and blocks). If the journal was perfectly full, and start was not equal to jhdr_size, then end would be equal to start. You would then be unable to differentiate between an empty and full journal. When the journal is not empty (contains transactions), it must be replayed to be sure the volume is consistent. That is, the data from each of the transactions must be written to the correct blocks on disk. The journal info block describes where the journal header and journal buffer are stored. The journal info block is stored at the beginning of the allocation block whose number is stored in the journalInfoBlock field of the volume header. The journal info block is described by the data type JournalInfoBlock. Contains a set of one-bit flags. The currently defined bits are described below. An implementation must treat the undefined bits as reserved. This space is reserved for describing the device containing the journal when the journal is not stored in the volume itself (when kJIJournalOnOtherDeviceMask is set). The offset in bytes from the start of the device to the start of the journal header. When the journal is stored in the volume itself (kJIJournalInFSMask is set), this offset is relative to the start of the volume. The size in bytes of the journal, including the journal header and the journal buffer. This size does not include the journal info block. When set, the space for the journal header and transactions resides inside the volume being journaled. The offset field of the journal info block is relative to the start of the volume (allocation block number zero). When set, the space for the journal header and journal buffer does not reside inside the volume being journaled. The device_signature field in the journal info block describes the device containing the journal. This bit is set to indicate that the journal header is invalid and needs to be initialized. This bit is typically set when the journal is first created, and the space has been allocated; the first mount of the journaled volume typically initializes the journal header and clears this bit. When this bit is set, there are no valid transactions in the journal. Implementations must currently set kJIJournalInFSMask, but not kJIJournalOnOtherDeviceMask. Journals stored on a separate device are not currently supported. The format of the device_signature field is not yet defined. The journal begins with a journal header, whose main purpose is to describe the location of transactions in the journal buffer. The journal header is stored using the journal_header data type. Contains the value JOURNAL_HEADER_MAGIC (0x4a4e4c78). This is used to verify the integrity of the journal header. Contains the value ENDIAN_MAGIC (0x12345678). This is used to verify the integrity of the journal header. Contains the offset in bytes from the start of the journal header to the start of the first (oldest) transaction. Contains the offset in bytes from the start of the journal header to the end of the last (newest) transaction. Note that this field may be less than the start field, indicating that the transactions wrap around the end of the journal's circular buffer. If end equals start, then the journal is empty, and there are no transactions that need to be replayed. The size of the journal, in bytes. This includes the journal header and the journal buffer. This value must be equal to the value in the size field of the journal info block. The size of one block list header, in bytes. This value typically ranges from 4096 to 16384. The checksum of the journal header, computed as described below. The size of the journal header, in bytes. The journal header always occupies exactly one sector so that it can be updated atomically. Therefore, this value is equal to the sector size (for example, 2048 on many types of optical media). The block list header describes a list of blocks included in a transaction. A transaction may include several block lists if it modifies more blocks than can be represented in a single block list. The block list header is stored in a structure of type block_list_header. The maximum number of blocks (block_info items) this block list can describe. This field is used while in memory to keep track of journal buffer sizes. On disk, this field is reserved. The number of elements in the binfo array. Since the first element of the binfo array is used to chain multiple block lists into a single transaction, the actual number of data blocks is num_blocks - 1. The number of bytes occupied in the journal for this block list, including the block list header and the data for each of the blocks in the list. The next block list header (if any) will be bytes_used bytes from the start of the current block list header, wrapping from the end of the journal buffer to the start of the journal buffer if needed. The checksum of the block list header, including the first element of the binfo array (a total of 32 bytes). Alignment padding. An implementation must treat this field as reserved. A variable-sized array of blocks. The array contains num_blocks+1 entries. The first entry is used when a single transaction occupies multiple block lists, using the next field as described above. The remaining num_blocks entries describe where the data from this block list will be written to disk. The sector number where the data in this block must be written. If this field is 0xFFFFFFFFFFFFFFFF (all 64 bits set), then this block must be skipped and not written. This field is reserved for the first element of the binfo array. The number of bytes to be copied from the journal buffer to the above sector number. This value will be a multiple of 512. This field is reserved for the first element of the binfo array. This field is used while in memory to keep track of transactions that span multiple block lists. If this field is zero in the first block_info of a block list, then the transaction ends with this block list; otherwise, the transaction has one or more additional block lists. This field is meaningful only for the first element of the block list array. The actual on-disk value has no meaning beyond testing for zero or non-zero. The journal header and block list header both contain checksum fields. These checksums can be verified as part of a basic consistency check of these structures. To verify the checksum, temporarily set the checksum field to zero and then call the calc_checksum routine with the address and size of the header being checksummed. The function result should equal the original value of the checksum field. In order to replay the journal, an implementation just loops over the transactions, copying each individual block in the transaction from the journal to its proper location on the volume. Once those blocks have been flushed to the media (not just the driver! ), it may update the journal header to remove the transactions. Replaying the journal does not guarantee that the temporary files associated with open but unlinked files are deleted. After replaying the journal, these temporary files may be deleted. Read the volume header into variable vhb. The volume may have an HFS wrapper; if so, you will need to use it to determine the location of the volume header. Test the kHFSVolumeJournaledBit in the attributes field of the volume header. If it is not set, there is no journal to replay, and you are done. Read the journal info block from the allocation block number vhb.journalInfoBlock, into variable jib. If kJIJournalNeedsInitMask is set in jib.flags, the journal was never initialized, so there is no journal to replay. Verify that kJIJournalInFSMask is set and kJIJournalOnOtherDeviceMask is clear in jib.flags. Read the journal header at jib.offset bytes from the start of the volume, and place it in variable jhdr. If jhdr.start equals jhdr.end, the journal does not have any transactions, so there is nothing to replay. Set the current offset in the journal (typically a local variable) to the start of the journal buffer, jhdr.start. Read a block list header of jhdr.blhdr_size bytes from the current offset in the journal into variable blhdr. For each block in bhdr.binfo to bhdr.binfo[blhdr.num_blocks], inclusive, copy bsize bytes from the current offset in the journal to sector bnum on the volume (to byte offset bnum*jdhr.jhdr_size). Remember that jhdr_size is the size of a sector, in bytes. If bhdr.binfo.next is zero, you have completed the last block list of the current transaction; set jhdr.start to the current offset in the journal. Remember that the journal is a circular buffer. When reading a block list header or block from the journal buffer (in the loop described above), you will need to check whether it wraps around the end of the journal buffer. If it would extend beyond the end of the journal buffer, you must stop reading at the end of the journal buffer, and resume reading at the start of the journal buffer (offset jhdr.jhdr_size bytes from the start of the journal). After replaying an entire transaction (all blocks in a block list, when bhdr.binfo is zero), or after replaying all transactions, you may update the value of the start field in the journal header to the current offset in the journal. This will remove those block lists from the journal since they have been written to their correct locations on disk. You must ensure that previous block writes complete before updating the journal header's start field on disk. One way to do this is to issue a flush to the device driver and wait until the device driver has written all dirty blocks, and then flush the device itself and wait for the device to write all dirty blocks to the media. HFSX volumes have a signature of 'HX' (0x4858) in the signature field of the volume header. The version field identifies the version of HFSX used on the volume; the only value currently defined is 5. If features are added that would be incompatible with older versions (that is, older versions cannot safely access or modify the volume because of the new features), then a different version number will be used. A new signature was required because some utilities did not use the version field properly. They would attempt to use or repair the volume (including changing the version field) when they encountered a version value that was not previously documented. If your implementation encounters an HFSX volume with a version value it does not recognize, it must not attempt to access or repair the volume. Catastrophic data loss may result. In particular, do NOT change the version field. It is intended that future HFSX features will result in the definition of new volume attribute bits, and that those bits will be used to indicate which features are in use on the volume. An HFSX volume never has an HFS wrapper. In an Apple partition map, the partition type (PMPartType) of an HFSX volume is set to "Apple_HFSX". Introduced in Mac OS X 10.3, HFSX version 5 allows volumes with case-sensitive file and directory names. Case-sensitive names means that you can have two objects, whose names differ only by the case of the letters, in the same directory at the same time. For example, you could have "Bob", "BOB", and "bob" in the same directory. An HFSX volume may be either case-sensitive or case-insensitive. Case sensitivity (or lack thereof) is global to the volume; the setting applies to all file and directory names on the volume. To determine whether an HFSX volume is case-sensitive, use the keyCompareType field of the B-tree header of the catalog file. A value of kHFSBinaryCompare means the volume is case-sensitive. A value of kHFSCaseFolding means the volume is case-insensitive. Do not assume that an HFSX volume is case-sensitive. Always use the keyCompareType to determine case-sensitivity or case-insensitivity. A case-insensitive HFSX volume (one whose keyCompareType is kHFSCaseFolding uses the same Unicode string comparison algorithm as HFS Plus. A case-sensitive HFSX volume (one whose keyCompareType is kHFSBinaryCompare) simply compares each character of the name as an unsigned 16-bit integer. The first character (the one with the smallest offset from the start of the string) that is different determines the relative order. The string with the numerically smaller character value is ordered before the string with the larger character value. For example, the string "Bob" would sort before the string "apple" because the code for the character "B" (decimal 66) is less than the code for the character "a" (decimal 97). Case-sensitive names do not ignore Unicode "ignorable" characters. This means that a single directory may have several names which would be considered equivalent using Unicode comparison rules, but which are considered distinct on a case-sensitive HFSX volume. The null character (0x0000), as used in the name of the "HFS+ Private Data" directory used by hard links, sort first with case-sensitive compares, but last with case-insensitive compares. Mac OS X version 10.3 introduced a new policy for determining where to allocate space for files, which improves performance for most users. This policy places the volume metadata and frequently used small files ("hot files") near each other on disk, which reduces the seek time for typical accesses. This area on disk is known as the metadata zone. The volume metadata are the structures that let the file system manage the contents of the volume. It includes the allocation bitmap file, extents overflow file, and the catalog file, and the journal file. The volume header and alternate volume header are also metadata, but they have fixed locations within the volume, so they are not located in the hot file area. Mac OS X may use a quota users file and quota groups file to manage disk space quotas on a volume. These files aren't strictly metadata, but they are included in the metadata zone because of their heavy use by the OS and they are too large to be considered ordinary hot files. Implementations are encouraged not to interfere with the metadata zone policy. For example, a disk optimizer should avoid moving files into the metadata zone unless that file is known to be frequently accessed, in which case it may be added to the "hot file" list. Similarly, files in the metadata zone should not be moved elsewhere on disk unless they are also removed from the hot file list. Allocation Bitmap File Physical size (totalBlocks times the volume's allocation block size) of the allocation bitmap file. In Mac OS X version 10.3, the amount of space reserved for the allocation file is actually the minimum allocation file size for the volume (the total number of allocation blocks, divided by 8, rounded up to a multiple of the allocation block size). If the allocation file is larger than that (which is sometimes done to allow a volume to be more easily grown at a later time), then there will be less space available for other metadata or hot files in the metadata zone. This is a bug (r. 3522516). The amount of space reserved for each type of metadata (except for the allocation bitmap file) is based on the total size of the volume. For the purposes of these computations, the total size of the volume is the allocation block size multiplied by the total number of allocation blocks. The sizes reserved for quota users and groups files are the result of complex calculations. In each case, the size reserved is a value of the form (items + 1) * 64 bytes, where items is based on the size of the volume in gigabytes, rounded down. For the quota users file, items is 256 per gigabyte, rounded up to a power of 2, with a minimum of 2048, and a maximum of 2097152 (2M). For the quota groups file, items is 32 per gigabyte, rounded up to a power of 2, with a minimum of 2048, and a maximum of 262144 (256K). The quota files are considered hot files, and occupy the hot file area, even though they are larger than the maximum file size normally eligible to be a hot file. The total size of the metadata zone is the sum of the above sizes, rounded up so that the metadata zone is represented by a whole number of allocation blocks within the volume bitmap. That is, the start and end of the metadata zone fall on allocation block boundaries in the volume bitmap. That means that the size of the metadata zone is rounded up to a multiple of 8 times the square of the allocation block size. In Mac OS X version 10.3, the extra space due to the round up of the metadata zone is split up between the catalog and the hot file area (2/3 and 1/3, respectively). The calculations for the extents overflow file and journal file divide the total size of the volume by 100GB, rounding down. Then they add one (to compensate for any remainder lost as part of the rounding). The result is then multiplied by 4MB or 8MB, respectively. If the volume's total size is not a multiple of 100GB, this is equivalent to 4MB (or 8MB) per 100GB, rounded up. In Mac OS X version 10.3, the metadata zone is located at the start of the volume, following the volume header. The hot file area is located towards the end of the metadata zone. When performing normal file allocations, the allocator will skip over the metadata zone. This ensures that the metadata will be less fragmented, and all of the metadata will be located in the same area on the disk. If the area outside the metadata zone is exhausted, the allocator will then use space inside the metadata zone for normal file allocations. Similarly, when allocating space for metadata, the allocator will use space inside the metadata zone first. If all of the metadata zone is in use, then metadata allocations will use space outside the metadata zone. Most files on a disk are rarely, if ever, accessed. Most frequently accessed (hot) files are small. To improve performance of these small, frequently access files, they are moved near the volume's metadata, into the metadata zone. This reduces seek times for most accesses. As files are moved into the metadata zone, they are also defragmented (allocated in a single extent), which further improves performance. This process is known as adaptive hot file clustering. The relative importance of a frequently used (hot) file is called its temperature. Files with the hottest (largest) temperatures are the ones actually moved into the metadata zone. In Mac OS X version 10.3, a file's temperature is computed as the number of bytes read from the file during the recording period divided by the file's size in bytes. This is a measure of how often the file is read. This section describes the on-disk structures used for tracking hot files. The algorithms used at run time are subject to change, and are not documented here. A B-Tree is used to keep track of the files that currently occupy the hot file area of the metadata zone. The hot file B-tree is an ordinary file on the volume (that is, it has records in the catalog). It is a file named ".hotfiles.btree" in the root directory. To avoid accidental manipulation of this file, the kIsInvisible and kNameLocked bits in the finderFlags field of the Finder info should be set. The node size of the hot file B-tree is at least 512 bytes, and is typically the same as the the volume's allocation block size. Like other B-trees on an HFS Plus volume, the key length field is 16 bits, and kBTBigKeysMask is set in the B-tree header's attributes. The btreeType in the header record must be set to kUserBTreeType. Must contain the value HFC_MAGIC (0xFF28FF26). Contains the version of the HotFilesInfo structure. Version 1 of the structure is described here. If your implementation encounters any other version number, it should not read or modify the hot file B-tree. Contains the duration of the current recording phase, in seconds. In Mac OS X 10.3, this value is typically HFC_DEFAULT_DURATION (60 hours). Contains the time that the current recording phase began, in seconds since Jan 1, 1970 GMT. Contains the time remaining in the current recording phase, in seconds. Contains the minimum temperature for a file to be eligible to be moved into the hot file area. Files whose temperature is less than this value will be moved out of the hot file area. Contains the maximum file size, in allocation blocks, for a file to be eligible to be moved into the hot file area. Files larger than this size will not be moved into the hot file area. In Mac OS X 10.3, this value is typically HFC_MAXIMUM_FILESIZE divided by the volume's allocation block size. Contains the maximum number of files to place into the hot file area. Note that the hot file area may actually contain more than this number of files, especially if they previously existed in the hot file area before the beginning of the recording phase. This number represents the number of files that the hot file recording code intents to track and eventually place into the hot file area. Contains the null-terminated (C-style) string containing the ASCII text "CLUSTERED HOT FILES B-TREE " (not including the quotes). Note that the last six bytes are five spaces and the null (zero) byte. This field exists to make it easier to recognize the hot file B-tree when debugging or using a disk editor. An implementation should not attempt to verify or change this field. A key in the hot file B-tree is of type HotFileKey. The length of a hot file key, not including the keyLength field itself. Hot file keys are of fixed size. This field must contain the value 10. Indicates whether the fork being tracked is a data fork (value 0x00) or a resource fork (value 0xFF). In Mac OS X version 10.3, only data forks are eligible for placement into the hot file area. The fork's temperature. For hot file thread records, this field contains the value HFC_LOOKUPTAG (0xFFFFFFFF). The catalog node ID of the file being tracked. Hot file keys are compared first by temperature, then fileID, and lastly by forkType. All of these comparisons are unsigned. Much like the catalog file, the hot file B-tree stores two kinds of records: hot file records and thread records. Every fork in the hot file area has both a hot file record and a thread record in the hot file B-tree. Hot file records are used to find hot files based on their temperature. Thread records are used to find hot files based on their catalog node ID and fork type. Thread records in the hot file B-tree use a special value (HFC_LOOKUPTAG) in the temperature field of the key. The data for a thread record is the temperature of that fork, stored as a UInt32. So, given a catalog node ID and fork type, it is possible to construct a key for the fork's thread record. If a thread record exists, you can get the temperature from the thread's data to construct the key for the hot file record. If a thread record does not exist, then the fork is not being tracked as a hot file. Hot file records use all of the key fields as described above. The data for a hot file record is 4 bytes. The data in a hot file record is not meaningful. To aid in debugging, Mac OS X version 10.3 typically stores the first four bytes of the file name (encoded in UTF-8), or the ASCII text "????". When an implementation changes a hot file's temperature, the old hot file record must be removed, a new hot file with the new temperature must be inserted, and the thread record's data must be changed to contain the new temperature. The recording phase gathers information about file usage over time. In order to gather useful statistics, the recording phase may last longer than the duration of a single mount. Therefore, information about file usage is stored on disk so that it can accumulate over time. The clumpSize field of the fork data structure is used to record the amount of data actually read from a fork. Since the field is only 32 bits long, it stores the number of allocation blocks read from the file. The fork's temperature can be computed by dividing its clumpSize by its totalBlocks. HFS Plus makes heavy use of Unicode strings to store file and folder names. However, Unicode is still evolving, and its use within a file system presents a number of challenges. This section describes some of the challenges, along with the solutions used by HFS Plus. Before reading this section, you should read HFS Plus Names. An implementation must not use the Unicode utilities implemented by its native platform (for decomposition and comparison), unless those algorithms are equivalent to the HFS Plus algorithms defined here, and are guaranteed to be so forever. This is rarely the case. Platform algorithms tend to evolve with the Unicode standard. The HFS Plus algorithms cannot evolve because such evolution would invalidate existing HFS Plus volumes. The Mac OS Text Encoding Converter provides several constants that let you convert to and from the canonical, decomposed form stored on HFS Plus volumes. When using CreateTextEncoding to create a text encoding, you should set the TextEncodingBase to kTextEncodingUnicodeV2_0, set the TextEncodingVariant to kUnicodeCanonicalDecompVariant, and set the TextEncodingFormat to kUnicode16BitFormat. Using these values ensures that the Unicode will be in the same form as on an HFS Plus volume, even as the Unicode standard evolves. Unicode allows some sequences of characters to be represented by multiple, equivalent forms. For example, the character " " can be represented as the single Unicode character u+00E9 (latin small letter e with acute), or as the two Unicode characters u+0065 and u+0301 (the letter "e" plus a combining acute symbol). The Unicode Decomposition table contains a list of characters that are illegal as part of an HFS Plus string, and the equivalent character(s) that must be used instead. Any character appearing in a column titled "Illegal", must be replaced by the character(s) in the column immediately to the right (titled "Replace With"). Mac OS versions 8.1 through 10.2.x used decompositions based on Unicode 2.1. Mac OS X version 10.3 and later use decompositions based on Unicode 3.2. Most of the characters whose decomposition changed are not used by any Mac encoding, so they are unlikely to occur on an HFS Plus volume. The MacGreek encoding had the largest number of decomposition changes. In addition, the Korean Hangul characters with codes in the range u+AC00 through u+D7A3 are illegal and must be replaced with the equivalent sequence of conjoining jamos, as described in the Unicode 2.0 book, section 3.10. The characters with codes in the range u+2000 through u+2FFF are punctuation, symbols, dingbats, arrows, box drawing, etc. The u+24xx block, for example, has single characters for things like "(a)". The characters in this range are not fully decomposed; they are left unchanged in HFS Plus strings. This allows strings in Mac OS encodings to be converted to Unicode and back without loss of information. This is not unnatural since a user would not necessarily expect a dingbat "(a)" to be equivalent to the three character sequence "(", "a", ")" in a file name. The characters in the range u+F900 through u+FAFF are CJK compatibility ideographs, and are not decomposed in HFS Plus strings. So, for the example given earlier, " " must be stored as the two Unicode characters u+0065 and u+0301 (in that order). The Unicode character u+00E9 may not appear in a Unicode string used as part of an HFS Plus B-tree key. The HFS Plus case-insensitive string comparison algorithm is defined by the FastUnicodeCompare routine, shown below. This routine returns a value that tells the caller how the strings are ordered relative to each other: whether the first string is less than, equal to, or greater than the second string. An HFS Plus implementation may use this routine directly, or use another routine that produces the same relative ordering. The FastUnicodeCompare routine does not handle composed Unicode characters since they are illegal in HFS Plus strings. As described in Canonical Decomposition, all HFS Plus strings must be fully decomposed, with composing characters in canonical order. each of the upper bytes of the original Unicode char). might be larger than the number of non-ignorable characters. which is an invalid Unicode character). -- both strings at once? -- need to determine which one is less. no ignorables ) Full data tables omitted for brevity. It allows a computer with HFS (but no HFS Plus) support in ROM to start up from an HFS Plus volume. When creating the wrapper, Mac OS includes a System file containing the minimum code to locate and mount the embedded HFS Plus volume and continue booting from its System file. It improves the user experience when an HFS Plus volume is inserted in a computer that has HFS support but no HFS Plus support. On such a computer, the HFS wrapper will be mounted as a volume, which prevents error dialogs that might confuse the user into thinking the volume is empty, damaged, or unreadable. The HFS wrapper may also contain a Read Me document to explain the steps the user should take to access their files. The rest of this section describes how the HFS wrapper is laid out and how the HFS Plus volume is embedded within the wrapper. This section does not describe the HFS Plus volume format; instead, it describes additions to the HFS volume format that allow an HFS Plus volume (or some other volume) to be embedded in an HFS volume. However, as all Mac OS volumes are formatted with an HFS wrapper, all implementations should be able to parse the wrapper to find the embedded HFS Plus volume. An HFS Plus volume is not required to have an HFS wrapper. In that case, the volume will start at the beginning of the disk, and the volume header will be at offset 1024 bytes. However, Apple software currently initializes all HFS Plus volumes with an HFS wrapper. An HFS volume always contains a Master Directory Block (MDB), at offset 1024 bytes. The MDB is similar to an HFS Plus volume header. In order to support volumes embedded within an HFS volume, several unused fields of the MDB have been changed, and are now used to indicate the type, location, and size of the embedded volume. What was formerly the drVCSize field (at offset 0x7C) is now named drEmbedSigWord. This two-byte field contains a unique value that identifies the type of embedded volume. When an HFS Plus volume is embedded, drEmbedSigWord must be kHFSPlusSigWord ('H+'), the same value stored in the signature field of an HFS Plus volume header. What were formerly the drVBMCSize and drCtlCSize fields (at offset 0x7E) have been combined into a single field occupying four bytes. The new structure is named drEmbedExtent and is of type HFSExtentDescriptor. It contains the starting allocation block number (startBlock) where the embedded volume begins and number of allocation blocks (blockCount ) the embedded volume occupies. The embedded volume must be contiguous. Both of these values are in terms of the HFS wrapper's allocation blocks, not HFS Plus allocation blocks. The description of the HFS volume format in Inside Macintosh: Files describes these fields as being used to store the size of various caches, and labels each one as "used internally". To actually find the embedded volume's location on disk, an implementation must use the drAlBlkSiz and drAlBlSt fields of the MDB. The drAlBlkSiz field contains the size (in bytes) of the HFS allocation blocks. The drAlBlSt field contains the offset, in 512-byte blocks, of the wrapper's allocation block 0 relative to the start of the volume. This embedding introduces a transform between HFS Plus volume offsets and disk offsets. The HFS Plus volume exists on a virtual disk embedded within the real disk. When accessing an HFS Plus structure on an embedded disk, an implementation must add the offset of the embedded disk to the HFS Plus location. Listing 2 shows how one might do this, assuming 512-byte sectors. Listing 2. Sector transform for embedded volumes. In order to prevent accidentally changing the files in the HFS wrapper, the wrapper volume must be marked as software-write-protected by setting kHFSVolumeSoftwareLockBit in the drAtrb (volume attributes) field of the MDB. All correct HFS implementations will prevent any changes to the wrapper volume. To improve performance of HFS Plus volumes, the size of the wrapper's allocation blocks should be a multiple of the size of the HFS Plus volume's allocation blocks. In addition, the wrapper's allocation block start (drAlBlSt) should be a multiple of the HFS Plus volume's allocation block size (or perhaps 4 KB, if the HFS Plus allocation blocks are larger). If these recommendations are followed, the HFS Plus allocation blocks will be properly aligned on the disk. And, if the HFS Plus allocation block size is a multiple of the sector size, then blocking and deblocking at the device driver level will be minimized. The space occupied by the embedded volume must be marked as allocated in the HFS wrapper's volume bitmap (similar to the HFS Plus allocation file) and placed in the HFS wrapper's bad block file (similar to the HFS Plus bad block file). This doesn't mean the blocks are actually bad; it merely prevents the HFS Plus volume from being overwritten by newly created files in the HFS wrapper, being deleted accidentally, or being marked as free, usable space by HFS disk repair utilities. The kHFSVolumeSparedBlocksMask bit of the drAtrb (volume attributes) field of the MDB must be set to indicate that the volume has a bad blocks file. This section is not part of the HFS Plus volume format. It describes how the existing Mac OS implementation of HFS Plus creates HFS wrappers. It is provided for your information only. As initialized by the Mac OS Disk Initialization Package, the HFS wrapper volume contains five files in the root folder. Read Me -- The Read Me file, whose name is actually "Where_have_all_my_files_gone? ", contains text explaining that this volume is really an HFS Plus volume but the contents cannot be accessed because HFS Plus is not currently installed on the computer. It also describes the steps needed to install HFS Plus support. Localized system software will also create a localized version of the file with localized file name and text content. System and Finder (invisible) -- The System file contains the minimum code to locate and mount the embedded HFS Plus volume, and to continue booting from the System file in the embedded volume. The Finder file is empty; it is there to prevent older versions of the Finder from de-blessing the wrapper's root directory, which would prevent booting from the volume. Desktop DB and Desktop DF (invisible) -- The Desktop DB and Desktop DF files are an artifact of the way the files on the wrapper volume are created. In addition, the root folder is set as the blessed folder by placing its folder ID in the first SInt32 of the drFndrInfo (Finder information) field of the MDB. An HFS Plus volume is a complex data structure, consisting of many different inter-related data structures. Inconsistencies between these data structures could cause serious data loss. When an HFS Plus implementation mounts a volume, it must perform basic consistency checks to ensure that the volume is consistent. In addition, the implementation may choose to implement other, more advanced, consistency checks. Many of these consistency checks take a significant amount of time to run. While a safe implementation might run these checks every time a volume is mounted, most implementations will want to rely on the correctness of the previous implementation that modified the disk. The implementation may avoid unnecessary checking by determining whether the volume was last unmounted cleanly. If it was, the implementation may choose to skip a consistency check. An implementation can determine whether a volume was unmounted cleanly by looking at various flag bits in the volume header. See Volume Attributes for details. For an HFS Plus volume to work correctly with many implementations, it is vital that the nextCatalogID field of the volume header be greater than all CNIDs currently used in the catalog file. The algorithm to ensure this is as follows. The implementation must iterate through all the leaf nodes of the catalog file, looking for file and folder records, determining the maximum CNID of any file or folder in the catalog. Once it knows the maximum CNID value, the implementation must set nextCatalogID to a value greater than it. The consistency check of nextCatalogID must be skipped if kHFSCatalogNodeIDsReusedBit is set in the attributes field of the volume header. The implementation must then mark the allocation blocks containing the first 1536 bytes and the last 1024 bytes as allocated. These areas are either reserved or used by the volume header. The implementation must then mark the allocation blocks used by all extents in all special files (the catalog file, the extents overflow file, the allocation file, the attributes file, and the startup file) as allocated. These extents are all described in the volume header. The implementation must then walk the leaf nodes of the catalog file, marking all allocation blocks used by extents in file records (in the HFSPlusForkData structures for the data and resource forks). The implementation must then walk the leaf nodes of the extents overflow file, marking all allocation blocks used by all extents in all extent records as allocated. The implementation must then walk the leaf nodes of the attributes file, marking all allocation blocks used by all extents described in fork data attributes and extension attributes as allocated. To prevent the loss of user data, an implementation must perform this check every time it mounts a volume that wasn't unmounted cleanly. It is most important that an allocation block that is in use be marked in the allocation file. It is less important that an allocation block that is not in use be cleared in the allocation file. If an allocation block is marked as in-use by the allocation file, but not actually in use by any extent, then that allocation block is really just wasting space; it isn't otherwise dangerous. Volume format specifications are fun exhausting. Inside Macintosh: Files, especially the Data Organization on Volumes section. Finder Interface Reference section of the Carbon user experience documentation. Technical Note 1189: The Monster Disk Driver Technote, especially the Secrets of the Partition Map section. Algorithms in C , Robert Sedgewick, Addison-Wesley, 1992, especially the section on B-trees. Updated to include a warning about initializing disks with a small allocation block size. Updated to clarify the allocation block usage and placement of the alternate volume header on volumes where the disk size is not an even multiple of the allocation block size. Added information about the journal. Updated the HFS Plus Permissions section to describe the way Mac OS X uses permissions on disk. Added the Hard Links and Symbolic Links sections to describe how Mac OS X implements hard and symbolic links. Added information on how catalog node IDs can wrap around and be reused, in which case the CNID consistency check must be skipped. Added details about the Finder information in the volume header. Added a section on the Finder information for files and directories. Added a section about HFSX, an extension of HFS Plus that allows for case-sensitive file and directory names. Added a section about how Mac OS X version 10.3 uses a Metadata Zone and adaptive hot file clustering.